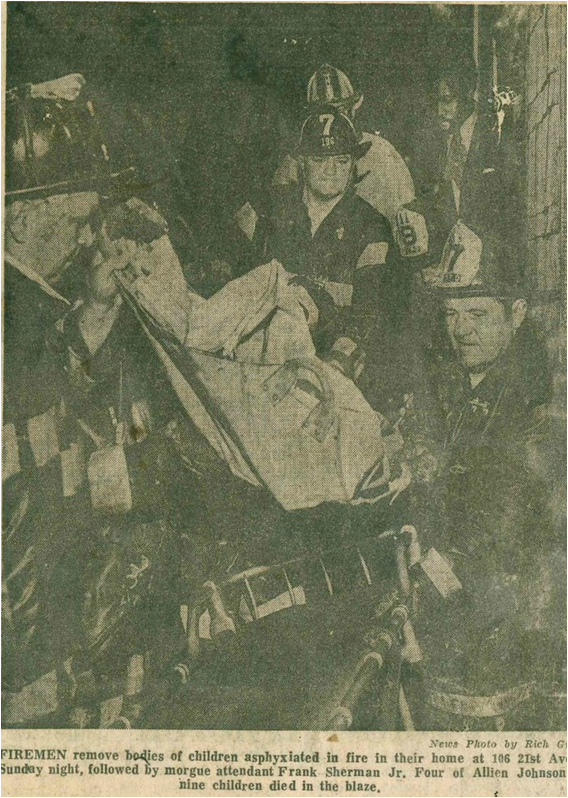 2005 Ball Book - Firefighter is Joe Parkin Sr, and PPD are Emil Gorla on the left and Anthony Verrone on right. 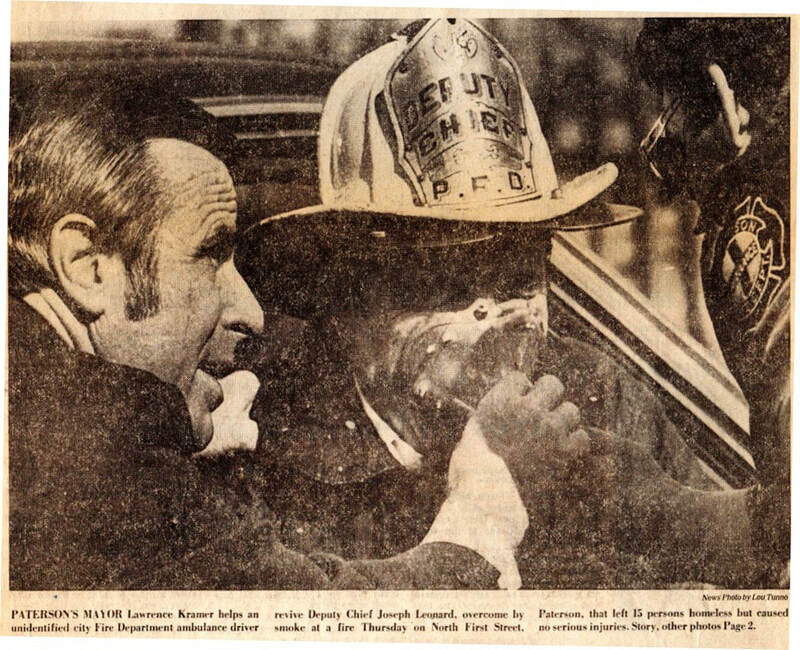 Notice boy trying on Parkin's helmet! 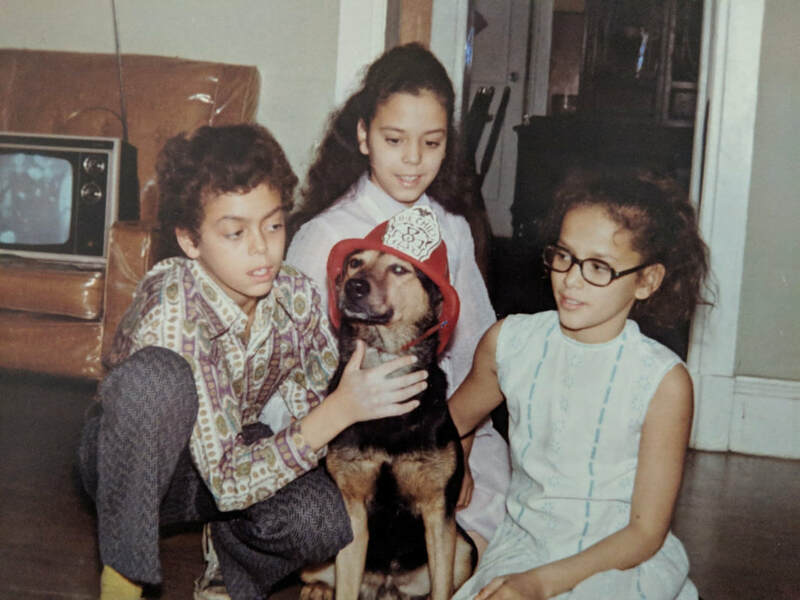 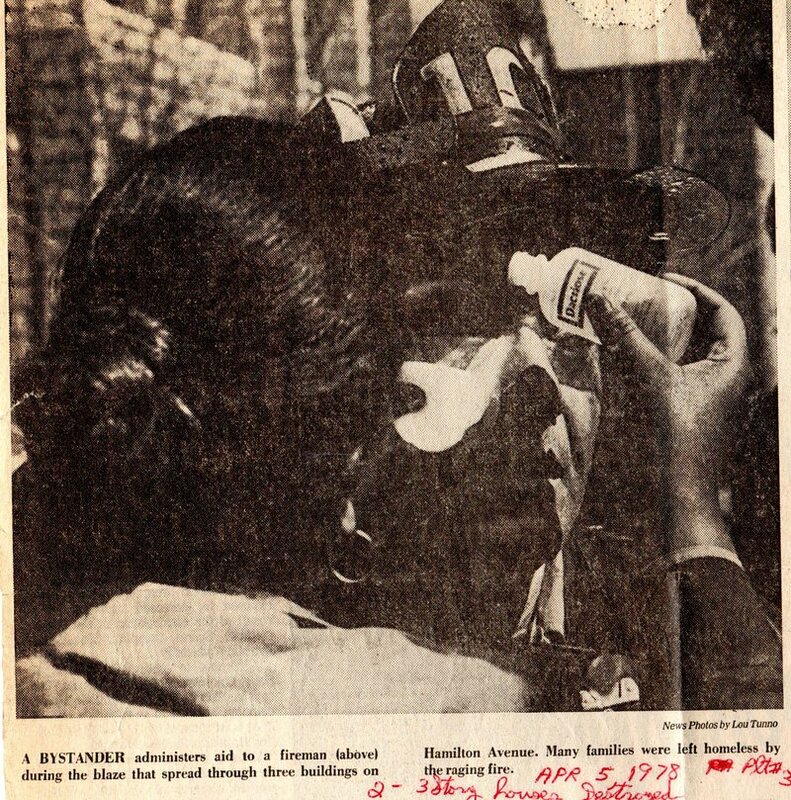 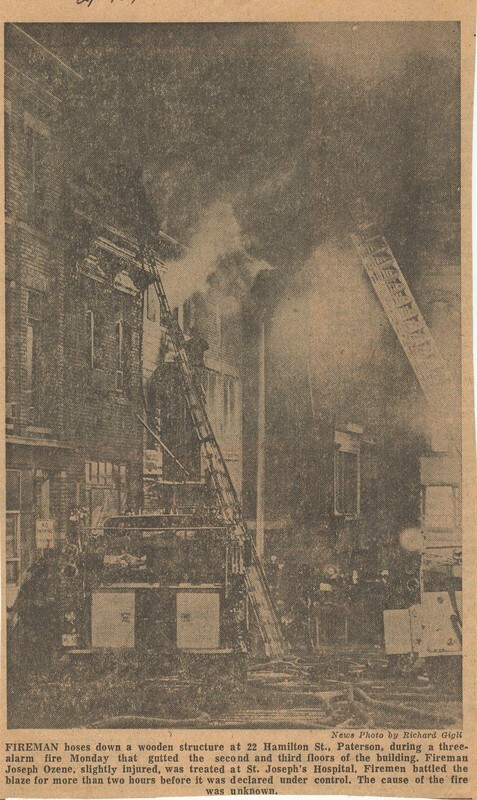 May 27, 1971: 254 2:40 PM Slater Street & Dale Avenue 4th ADCO Co.
January 28, 1972: 341 7:05 PM 439 Union Avenue 4th Baum Textile Co.
Mar. 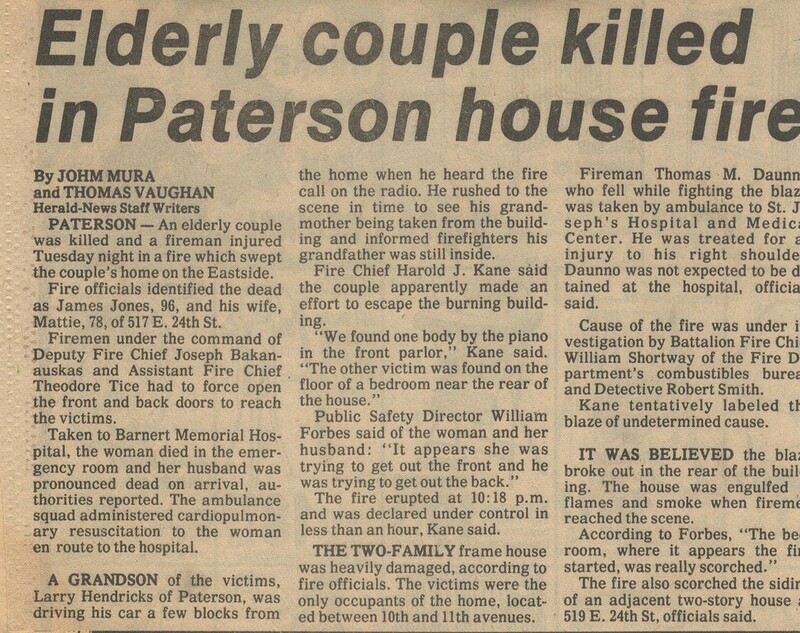 23: 656 171 Keen St. 3rd Leonardo Looms Co.
​​May 30, 1975: 145 6:18 AM 152-168 Market St. 4th McDonalds et al. 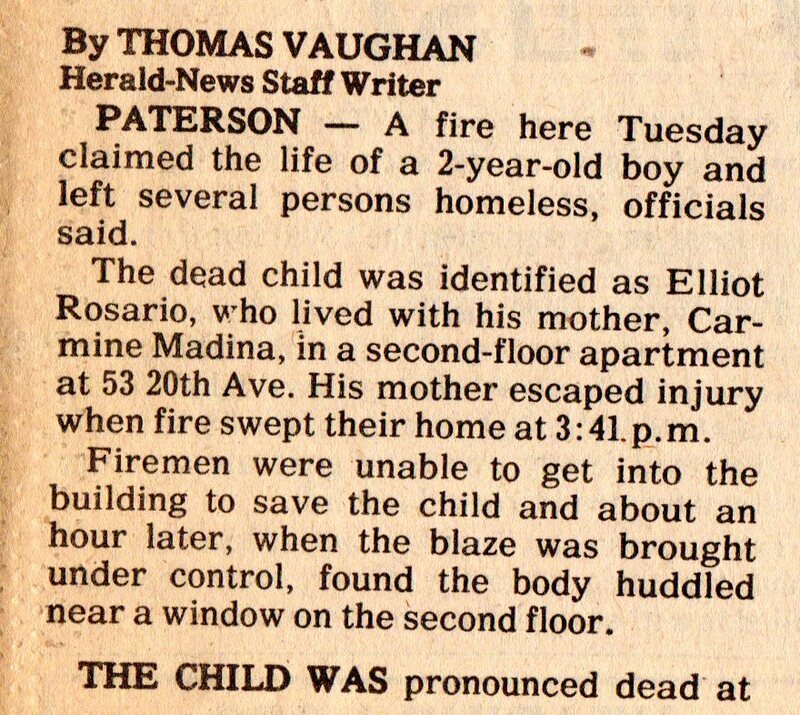 March 25, 1976: 515 7:30 PM 24 Van Houten Street 4th Fabricolor Corp.
June 25, 1977: 472 9:44 PM 96-106 Market St. 3rd Store & Apts. 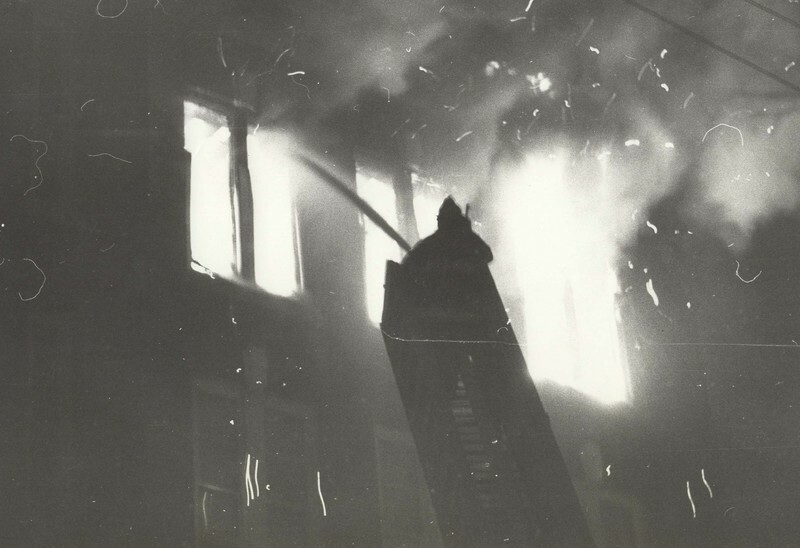 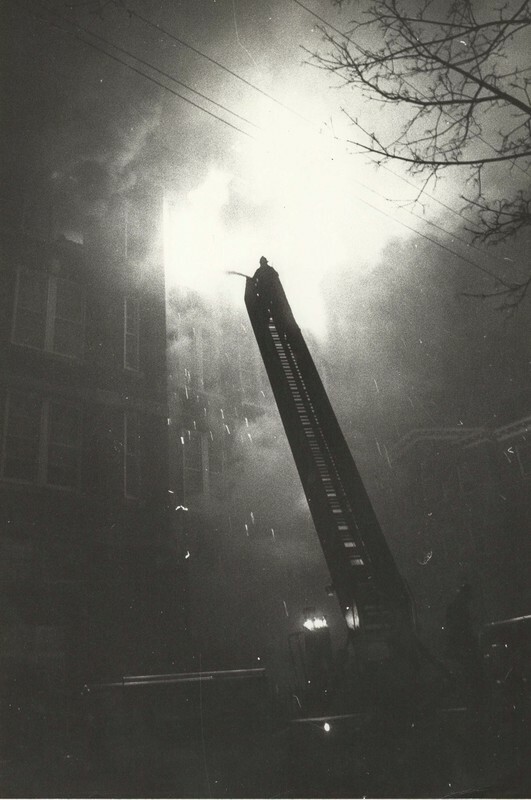 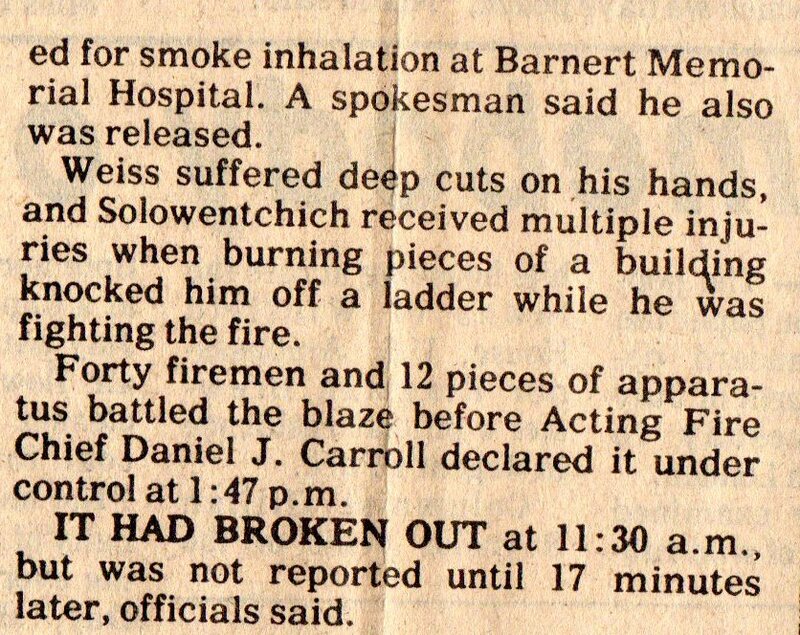 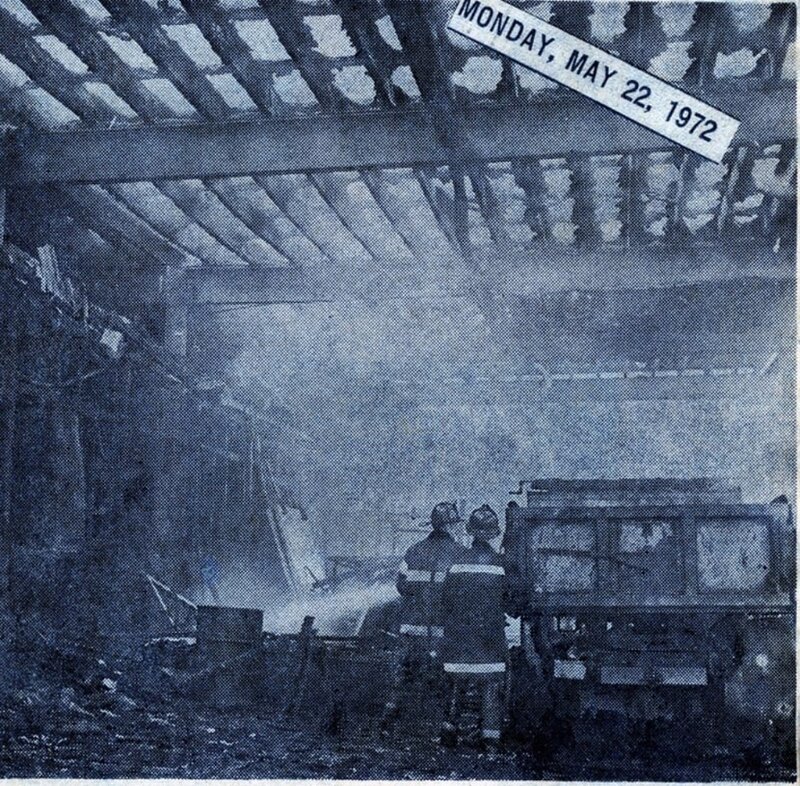 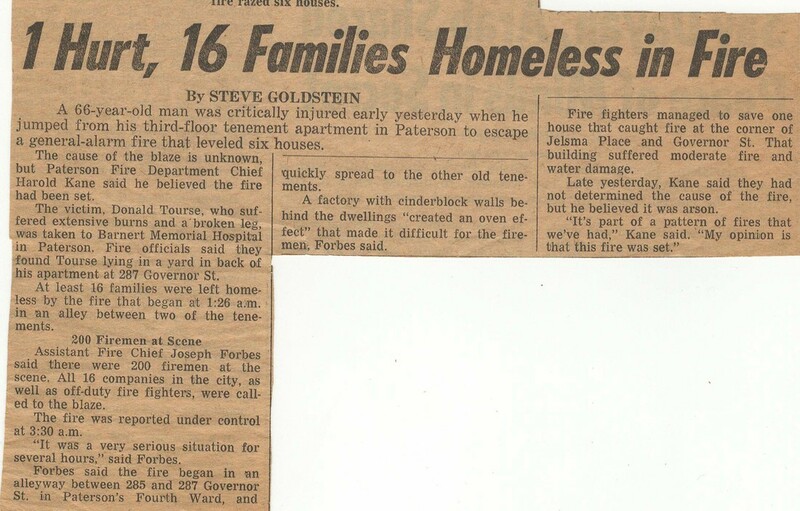 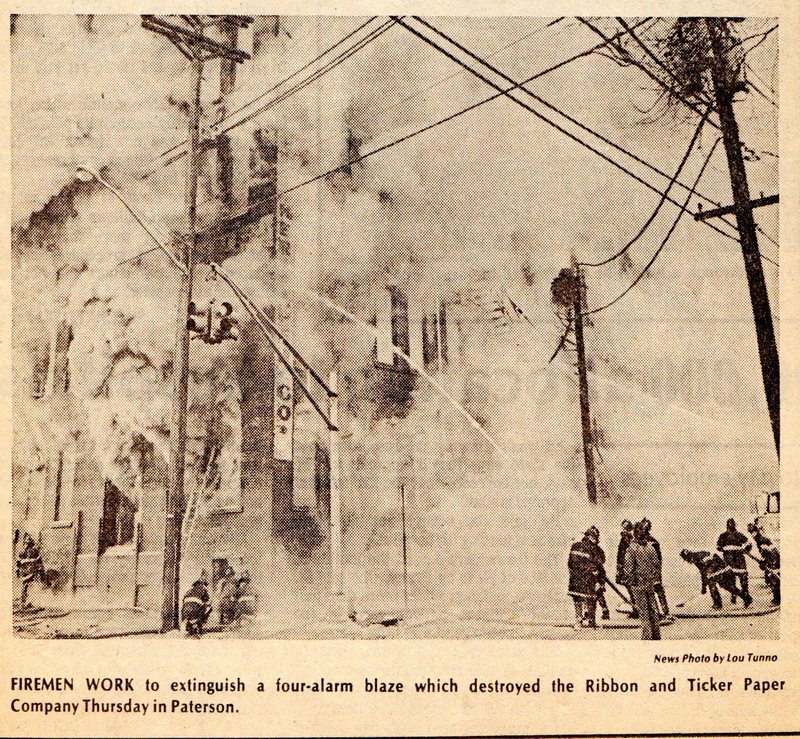 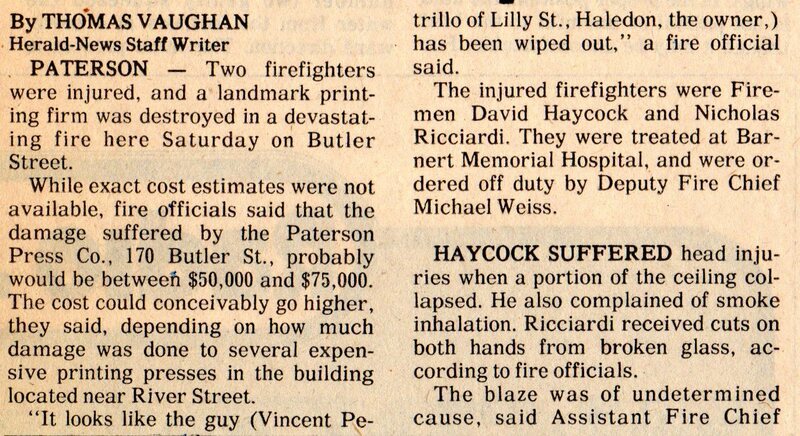 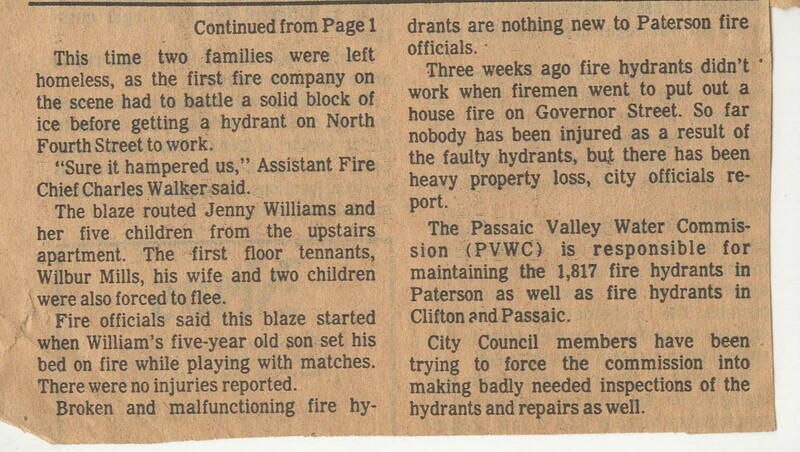 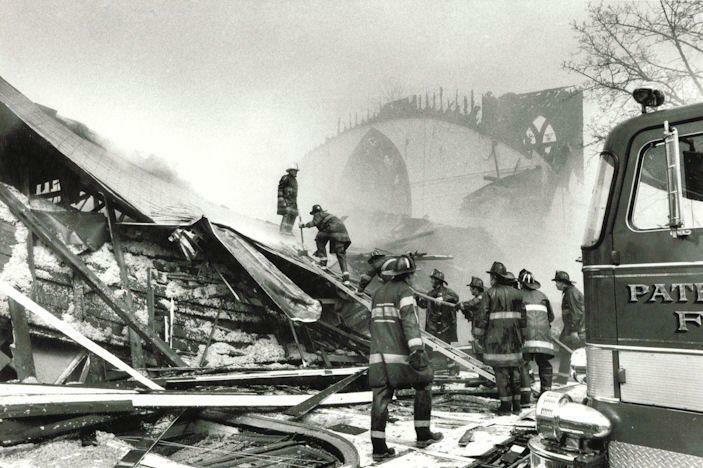 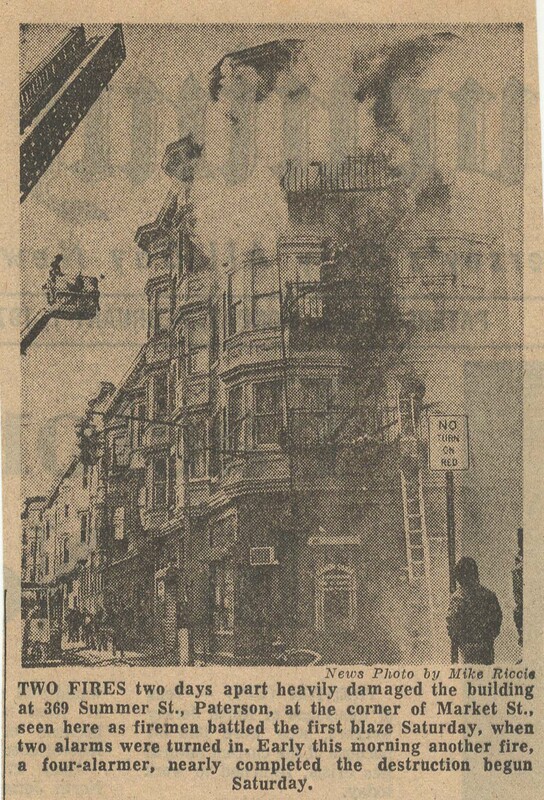 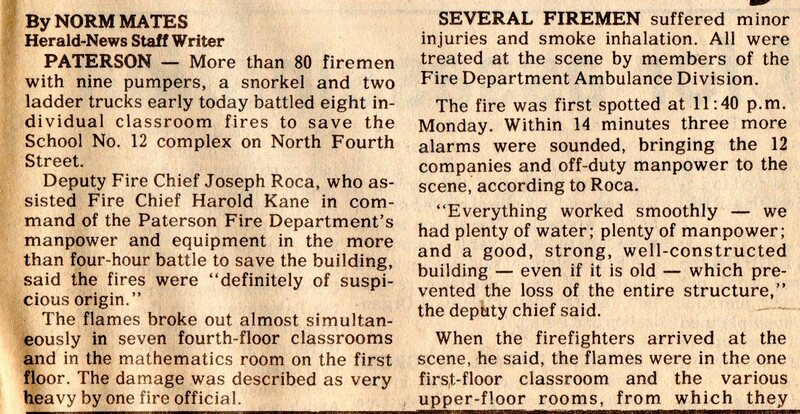 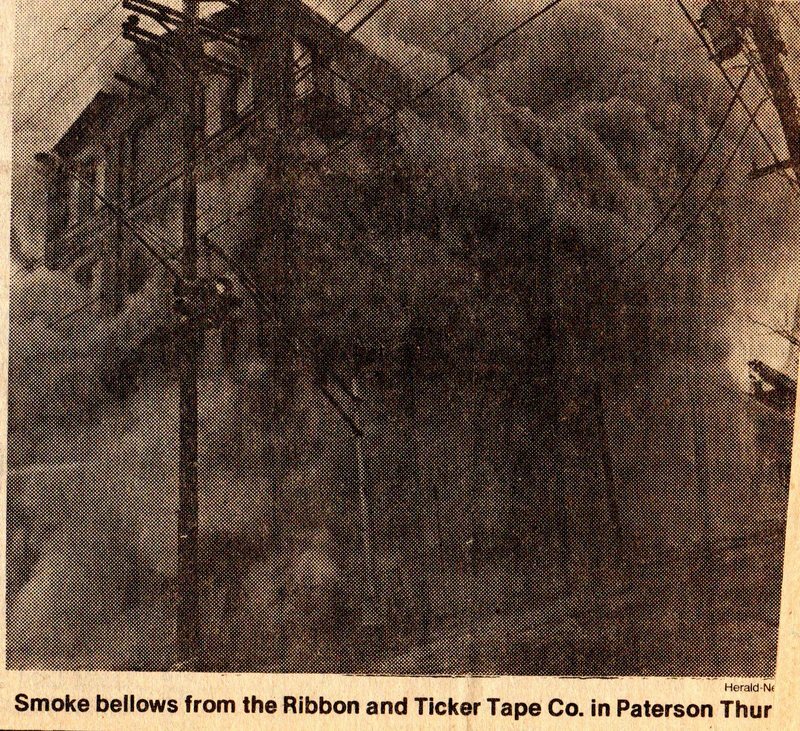 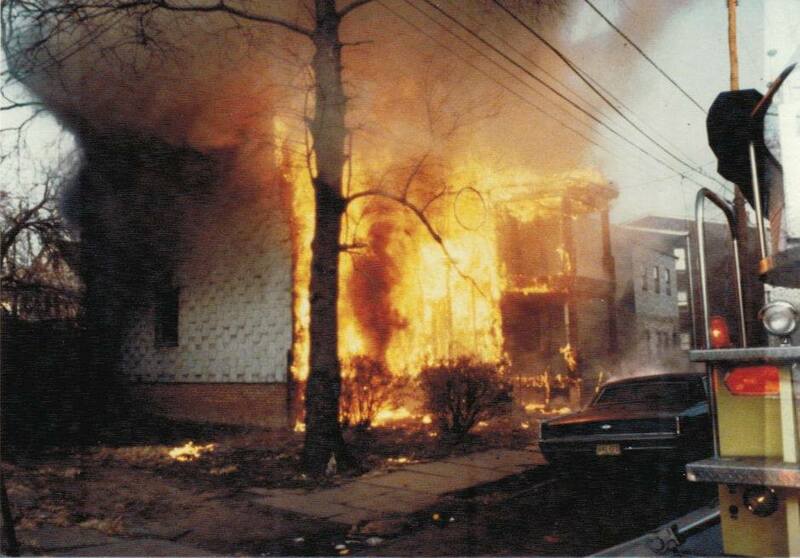 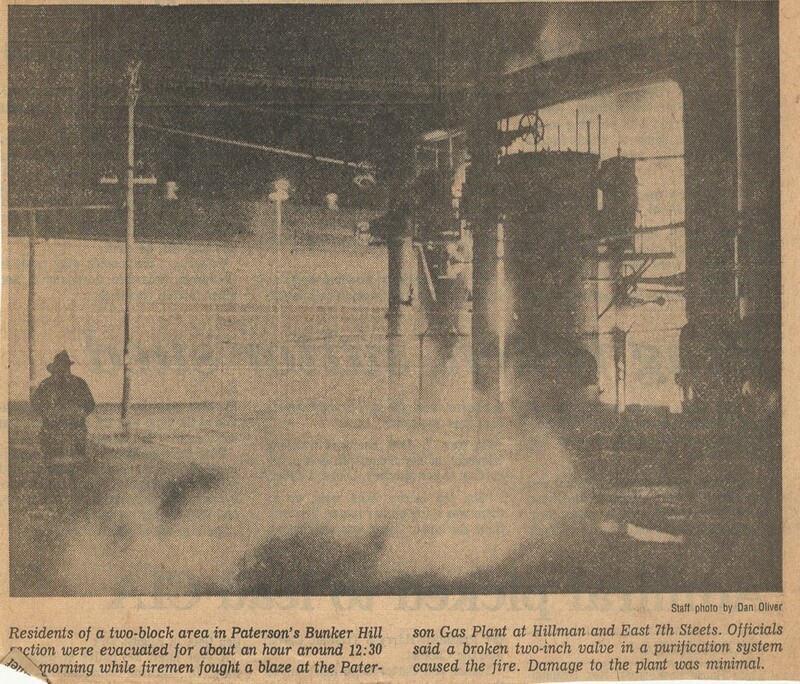 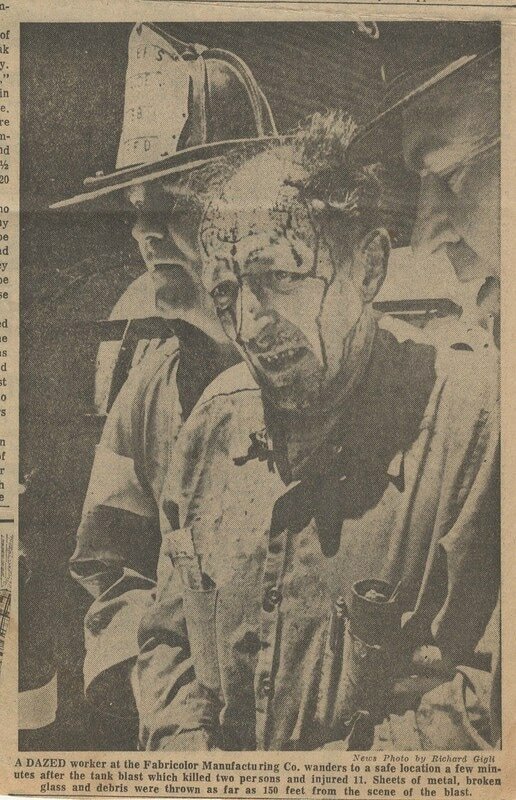 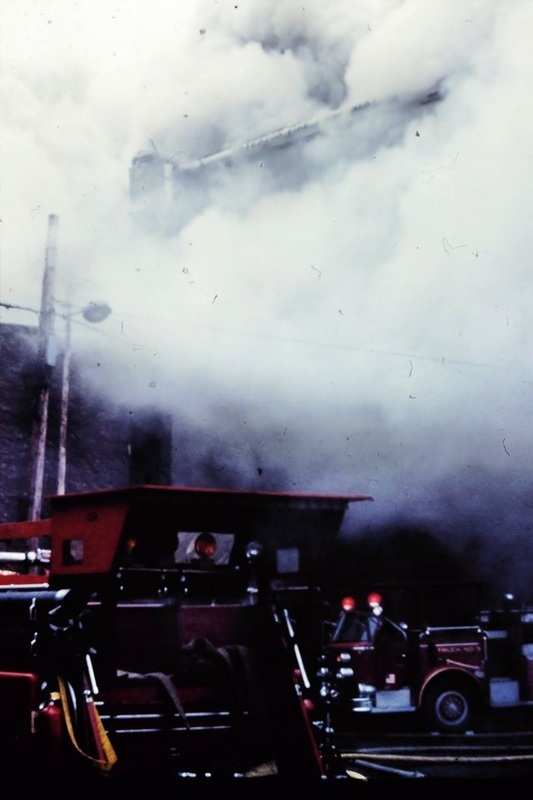 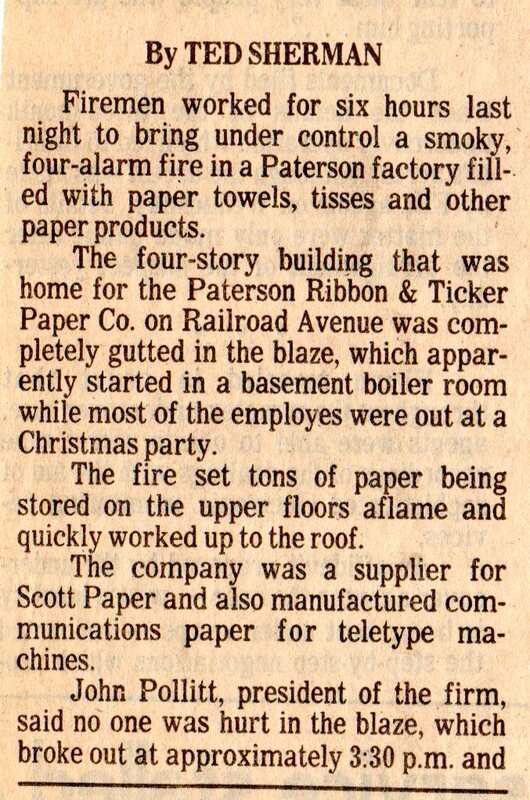 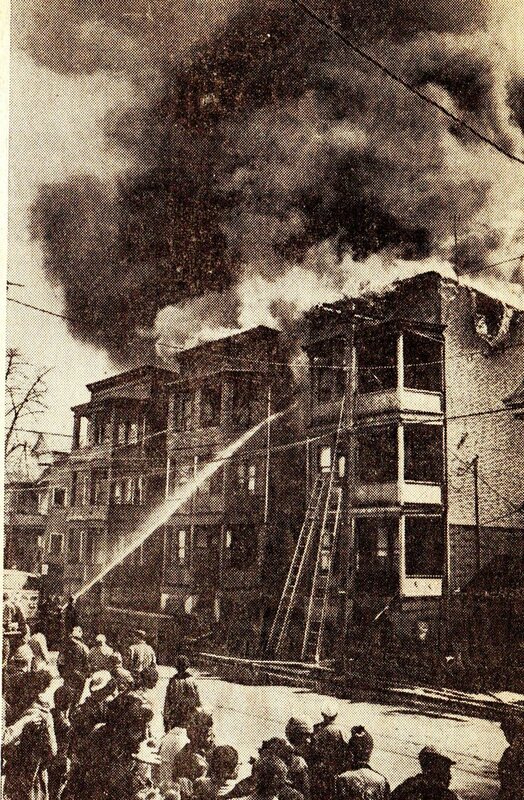 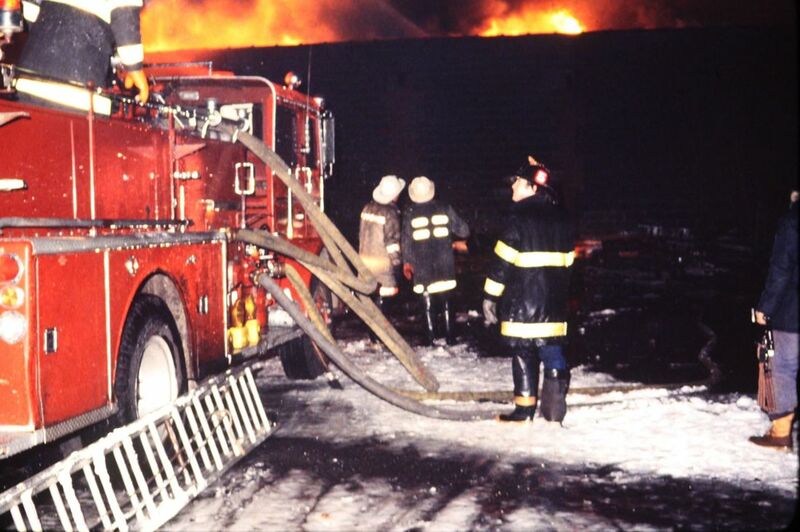 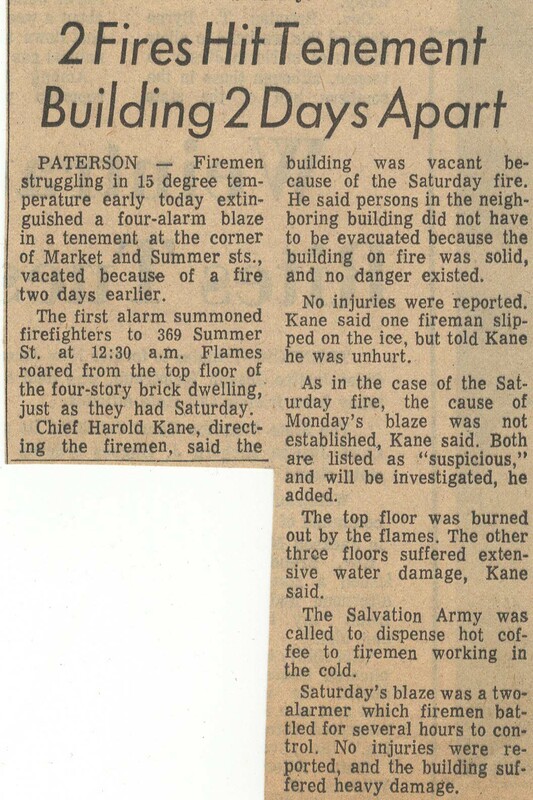 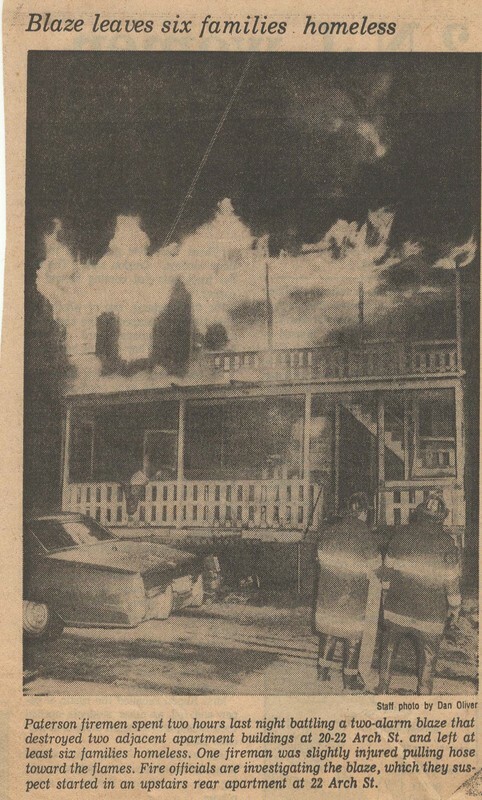 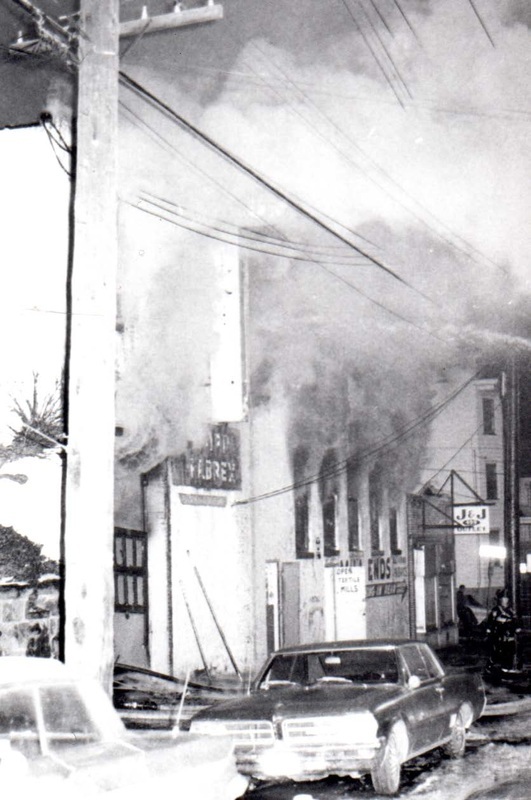 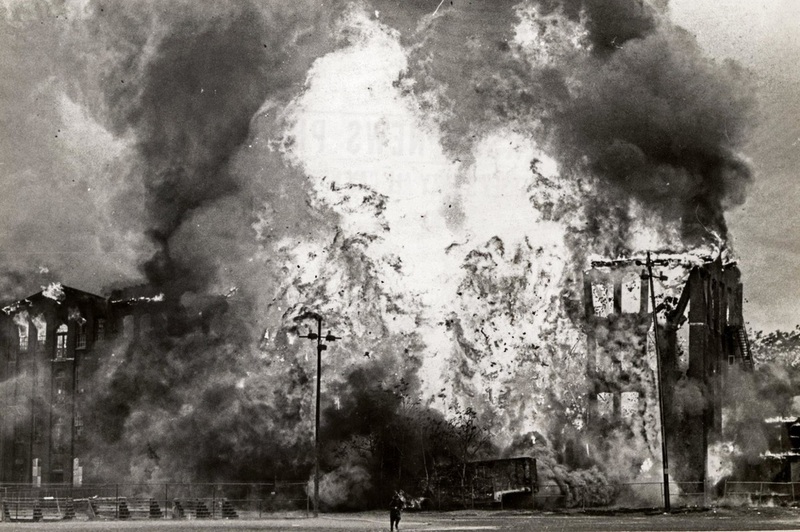 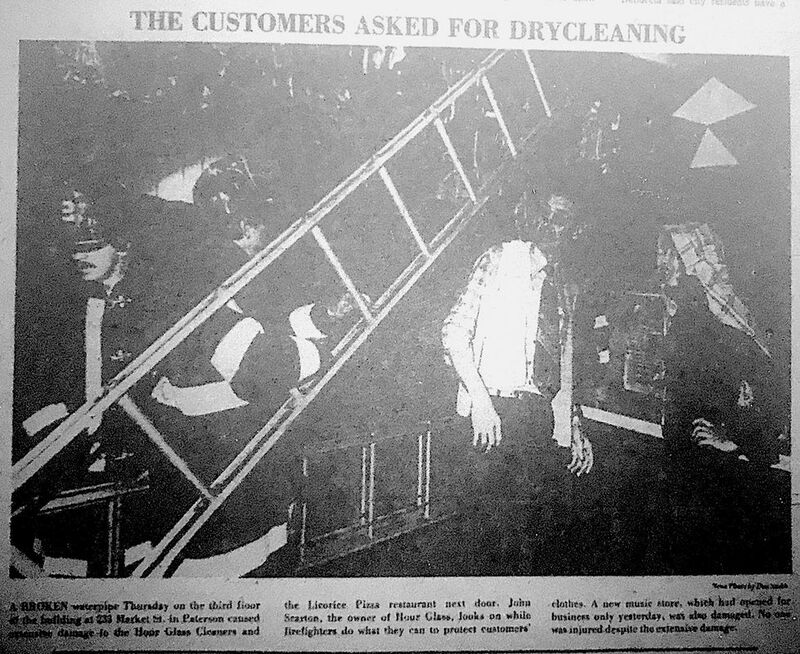 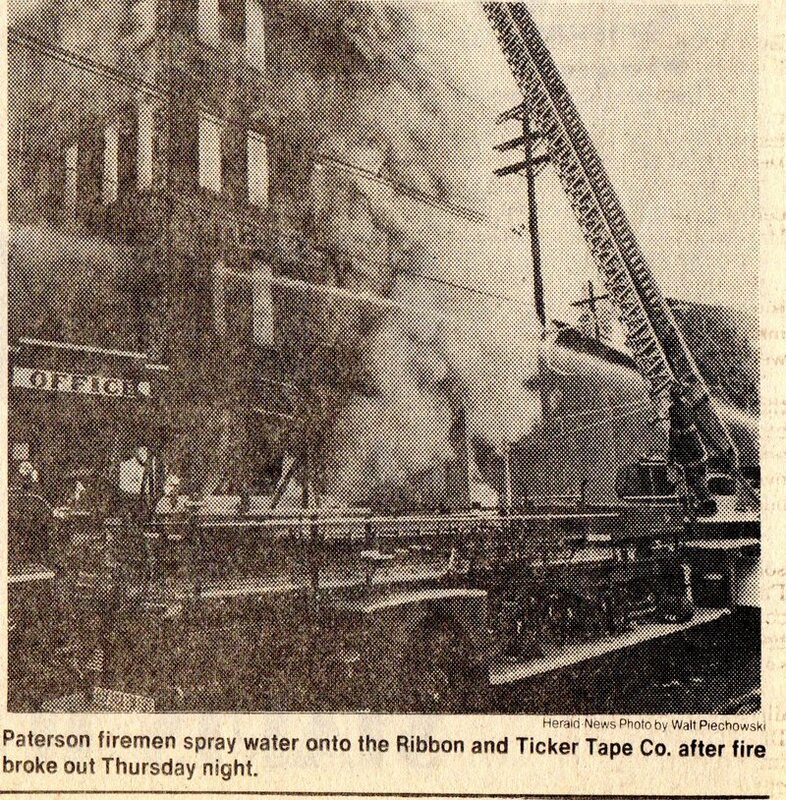 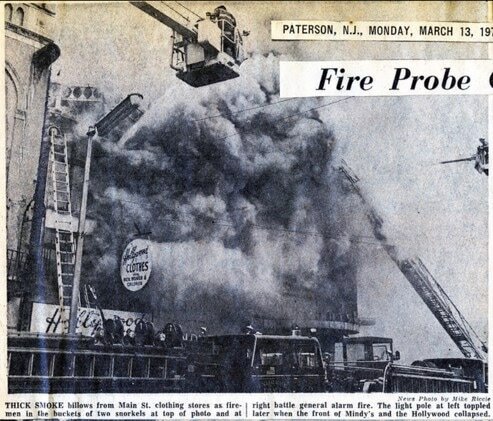 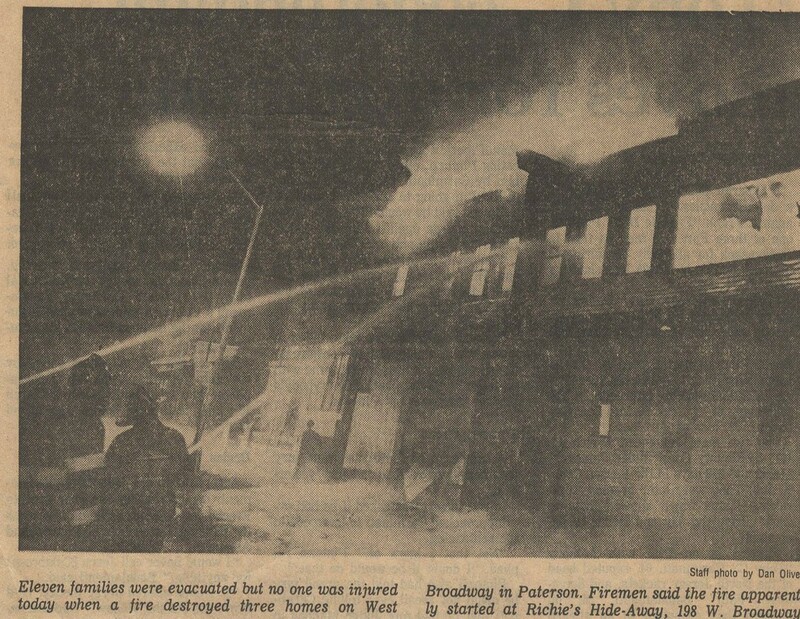 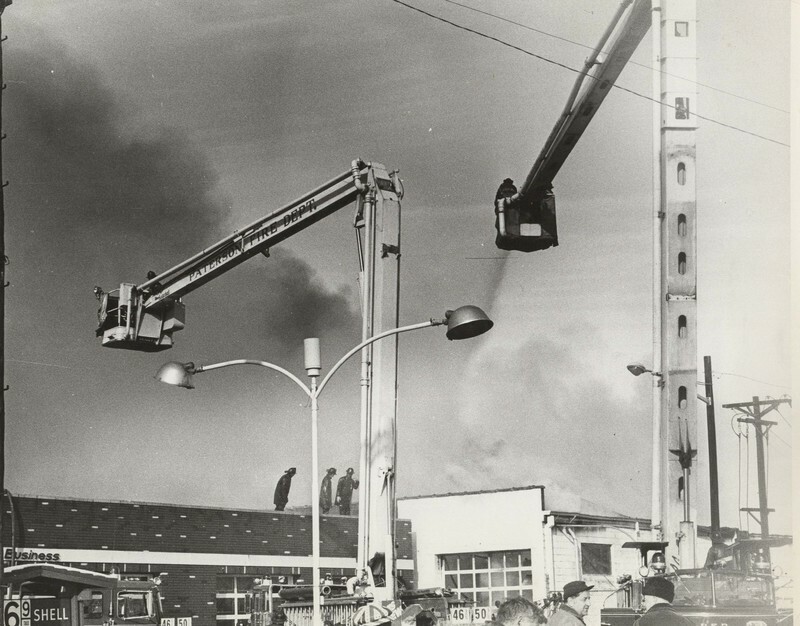 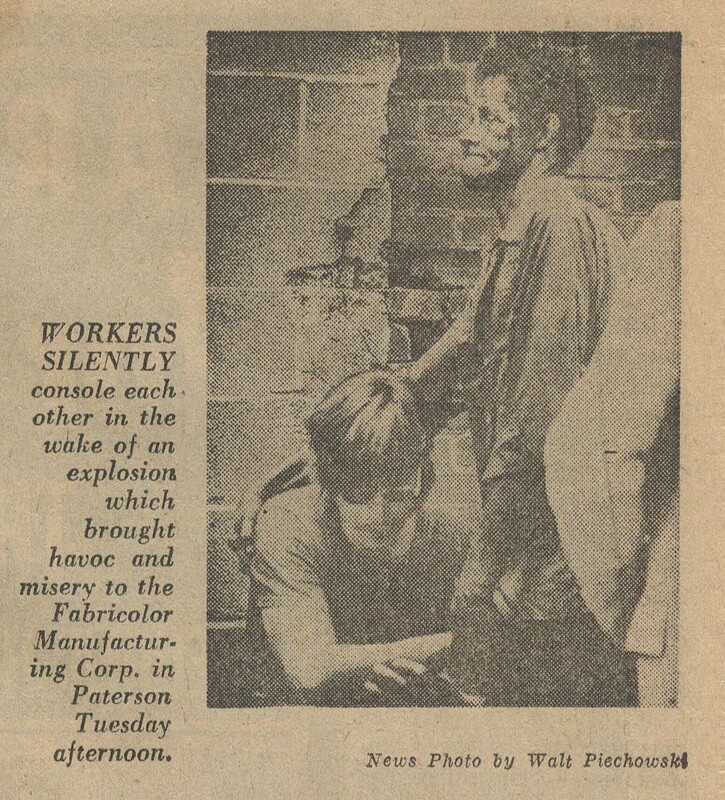 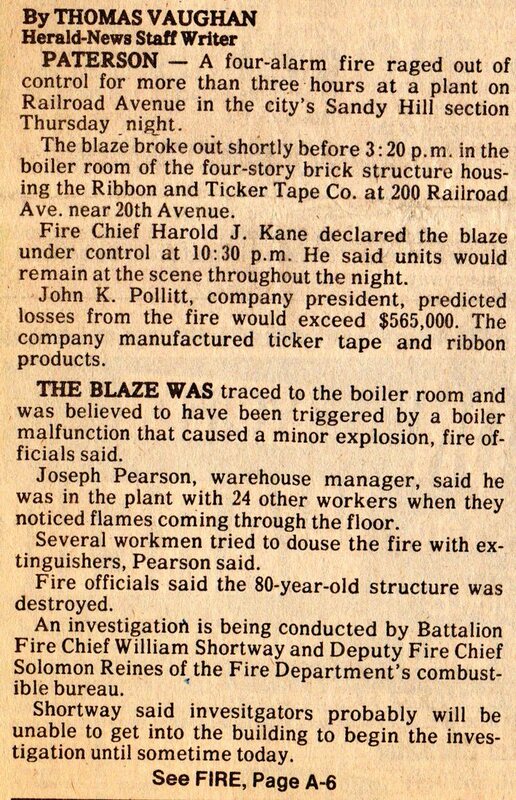 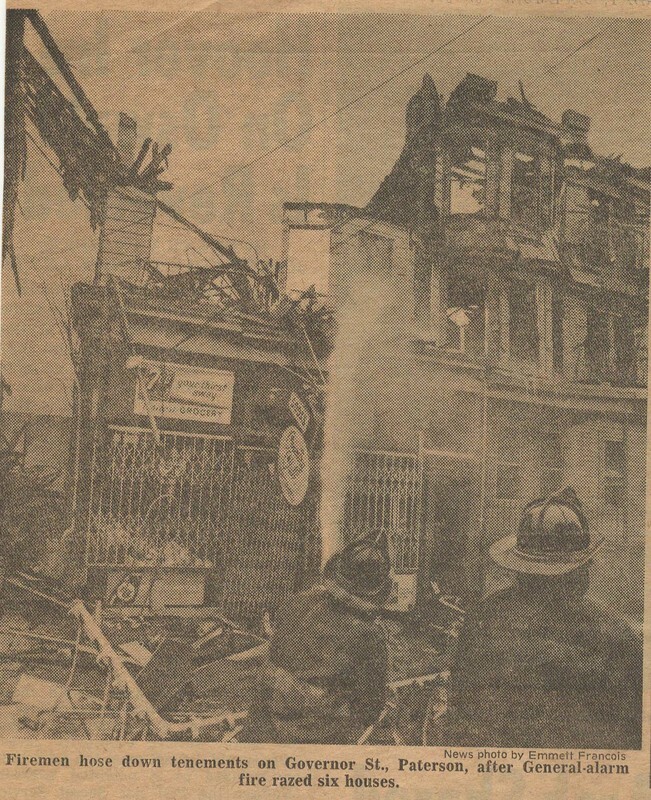 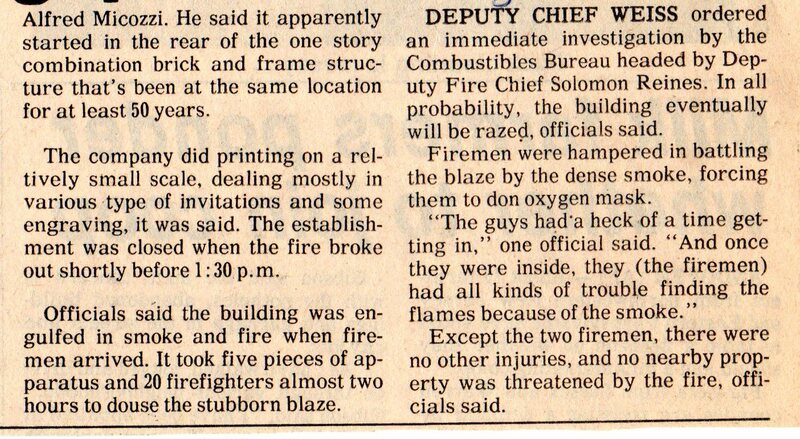 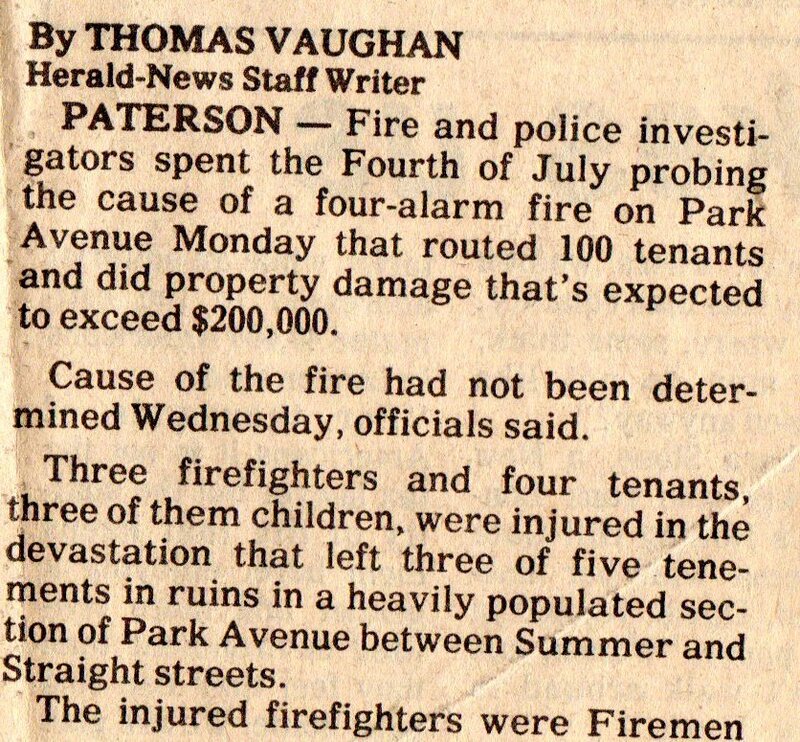 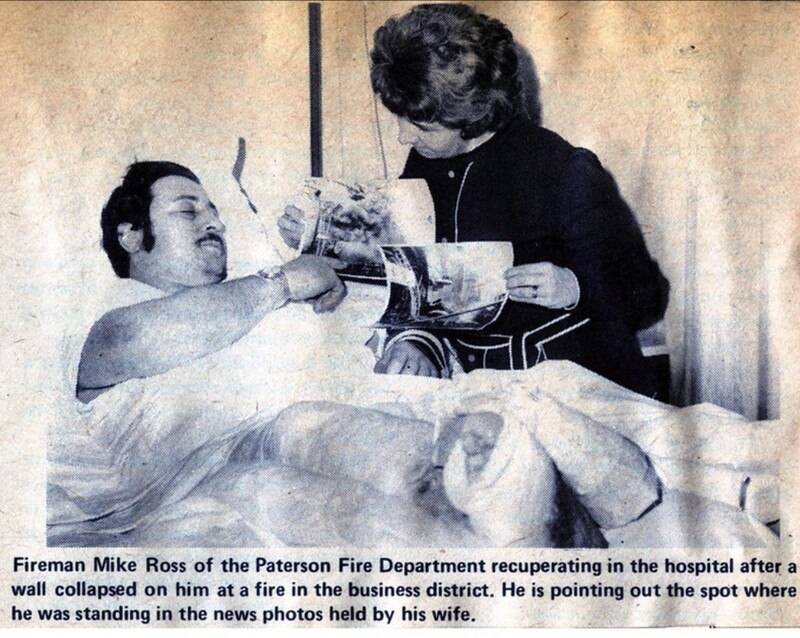 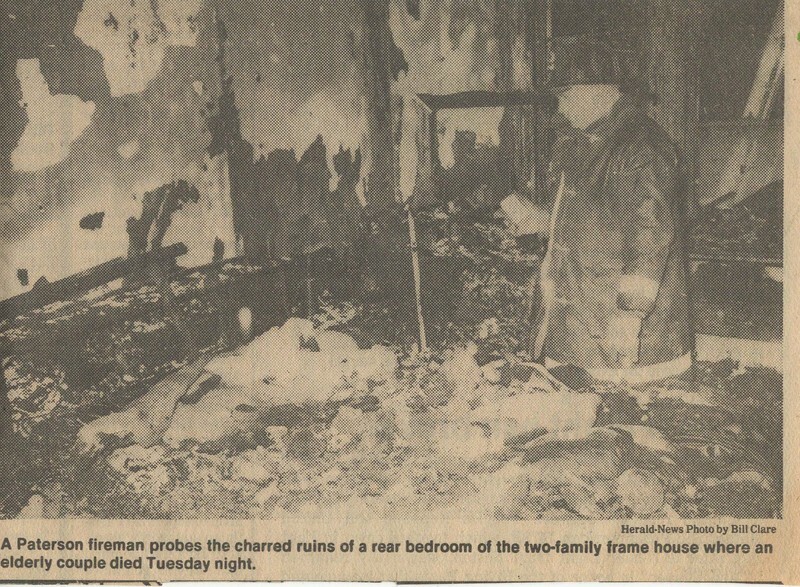 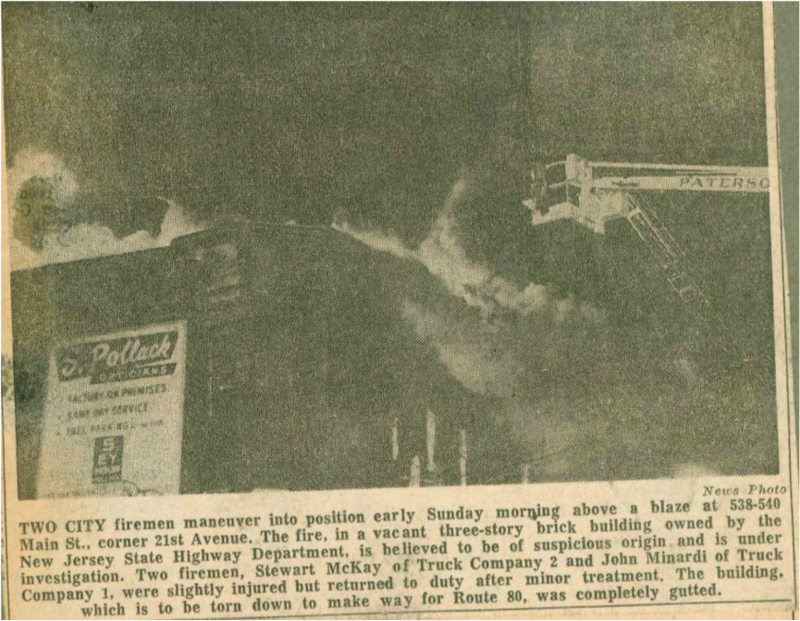 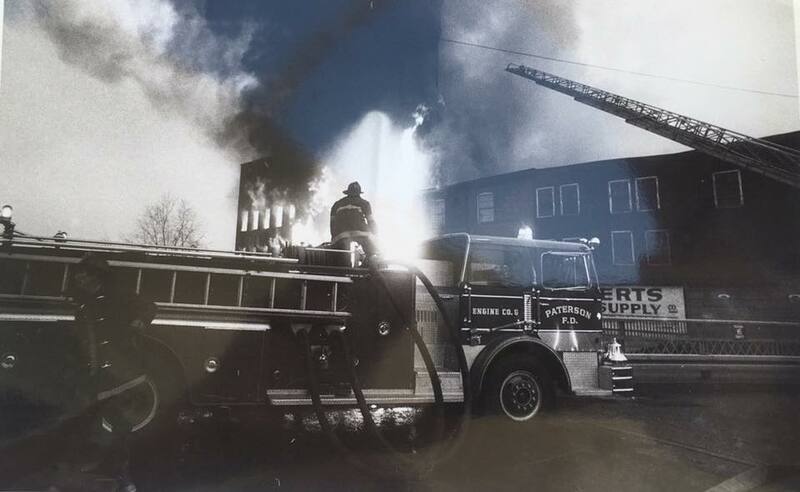 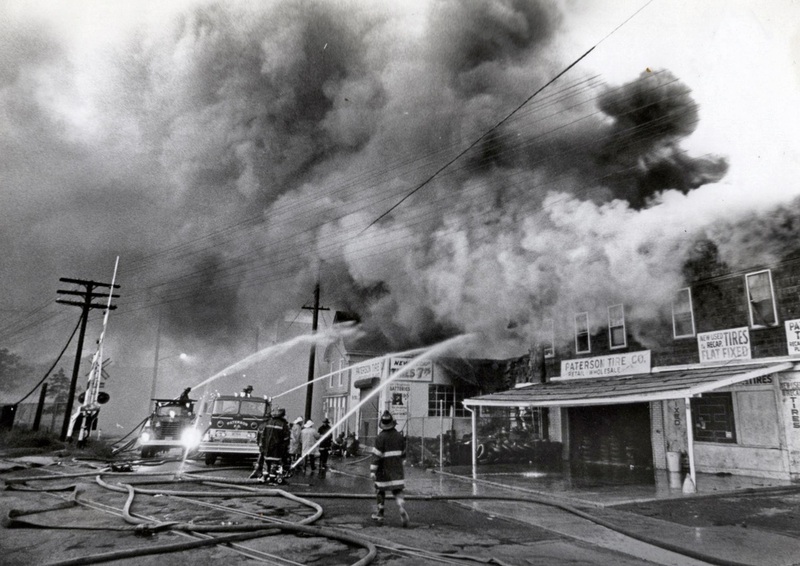 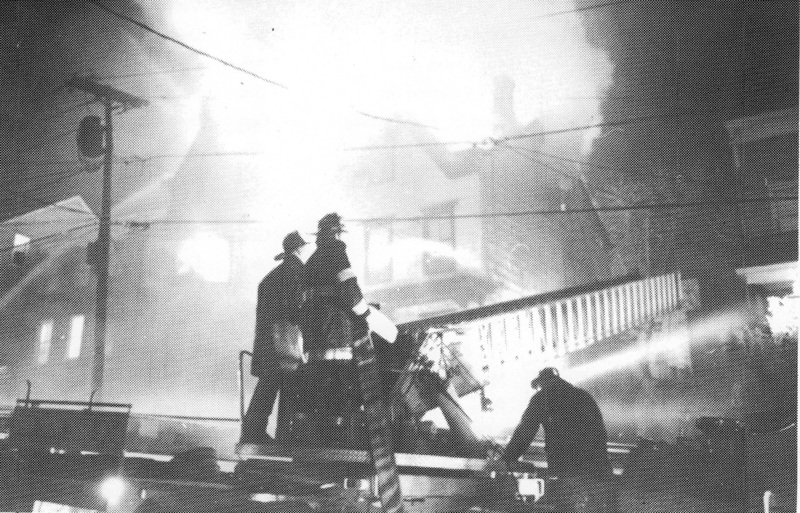 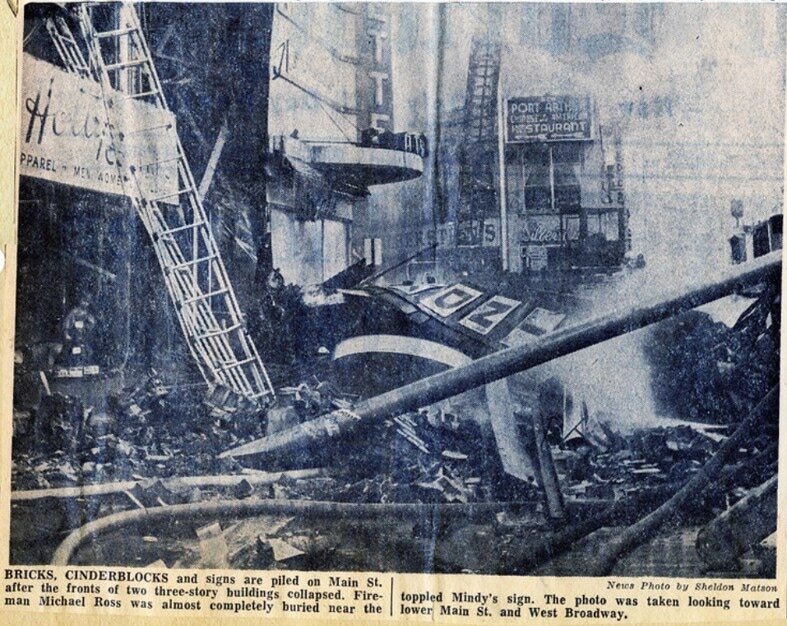 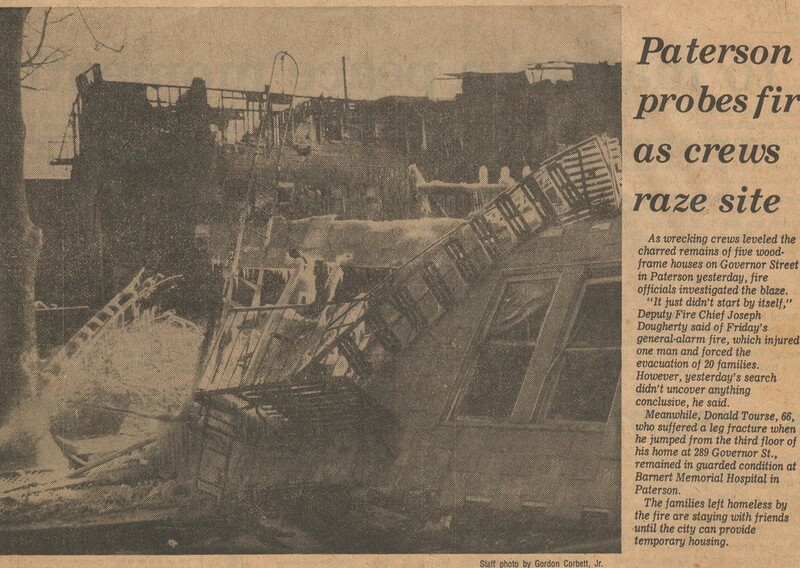 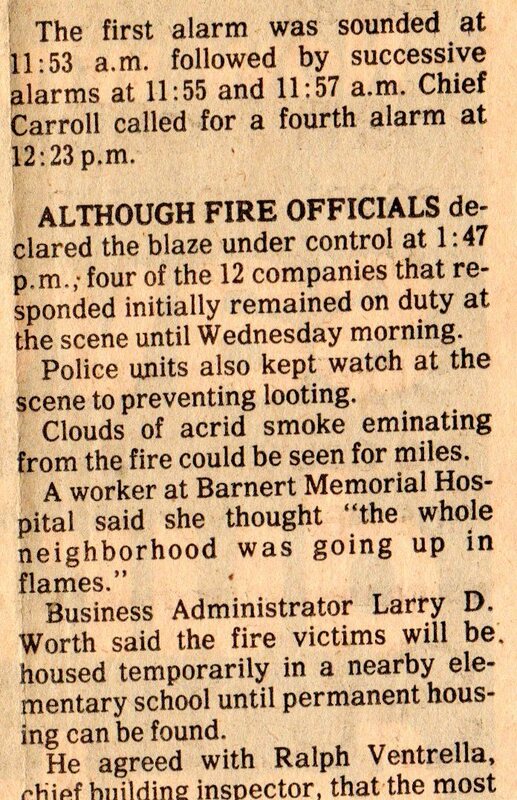 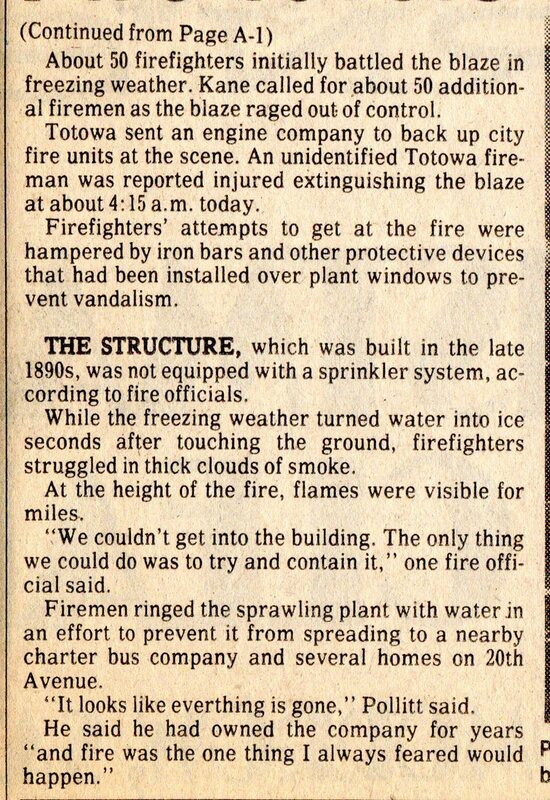 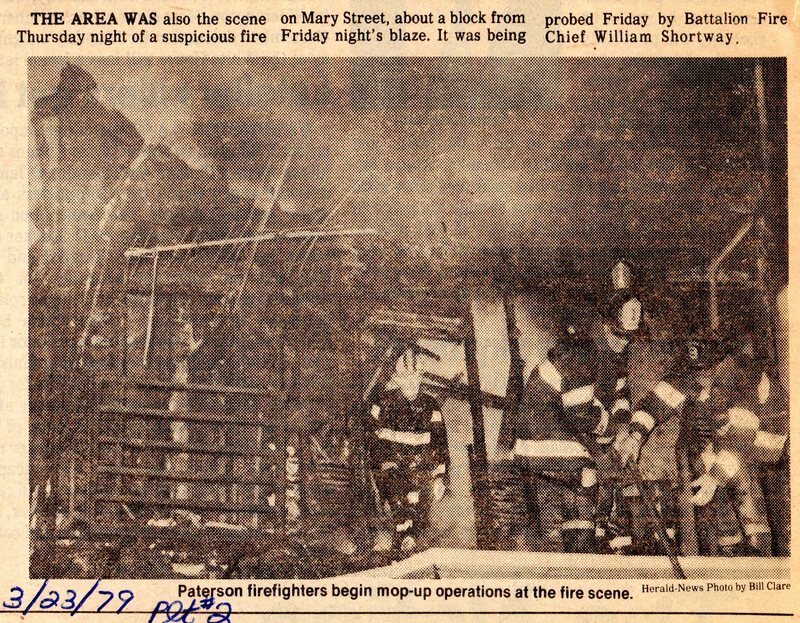 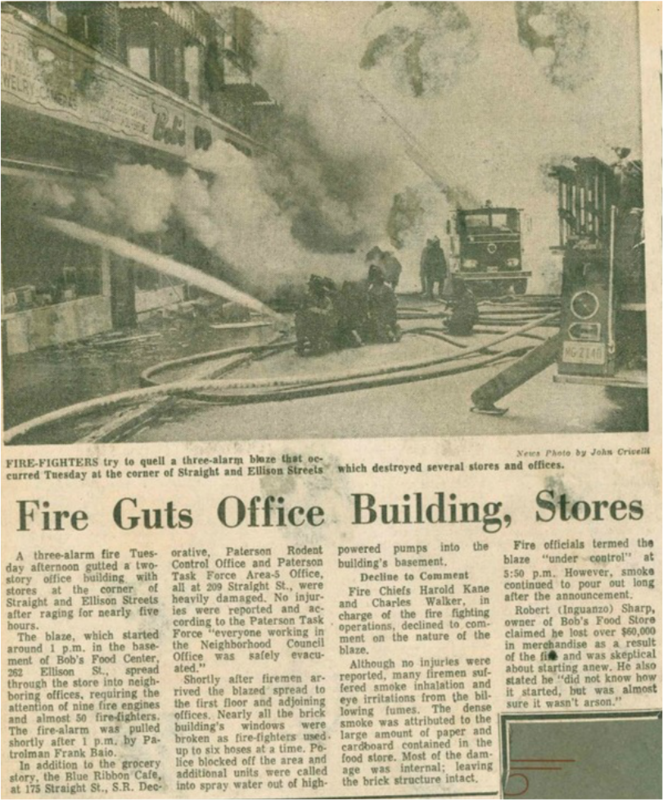 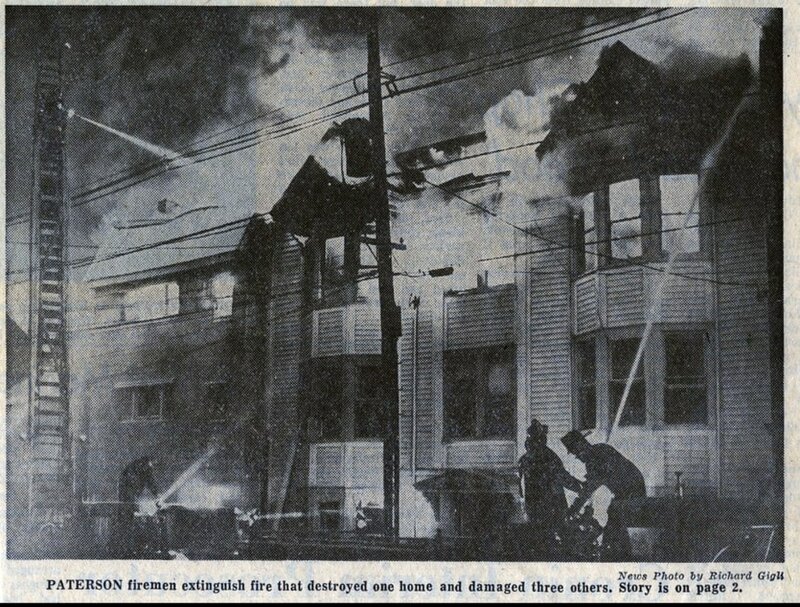 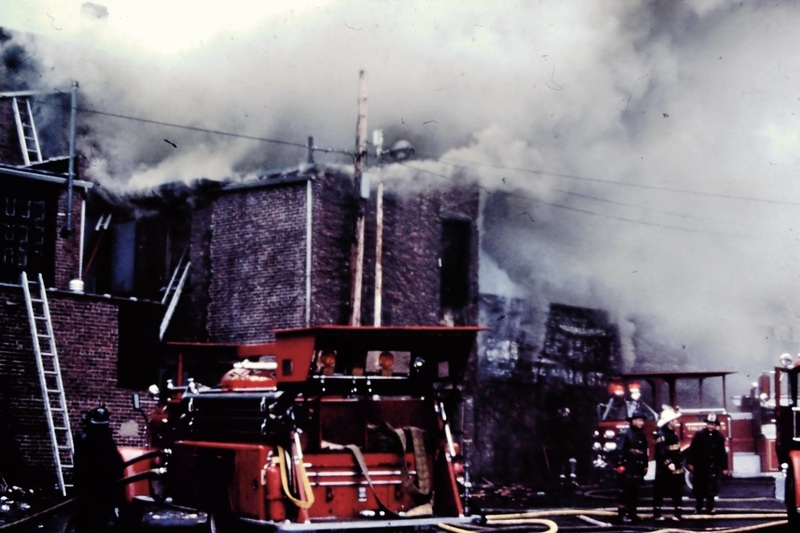 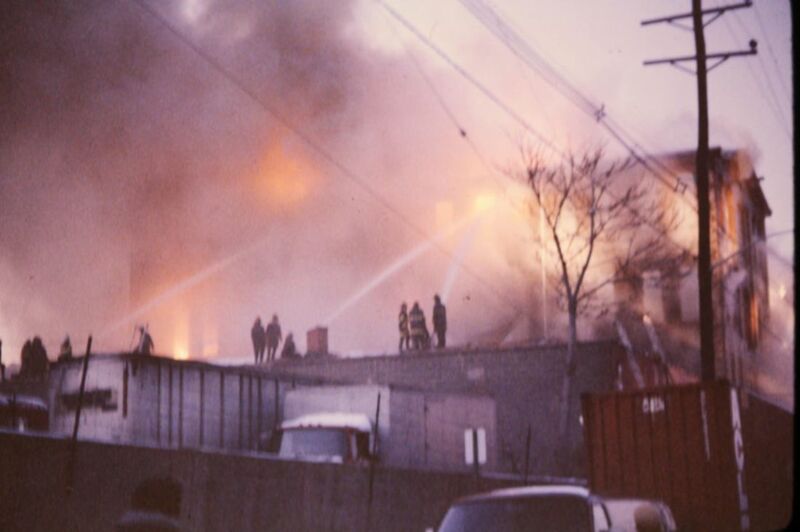 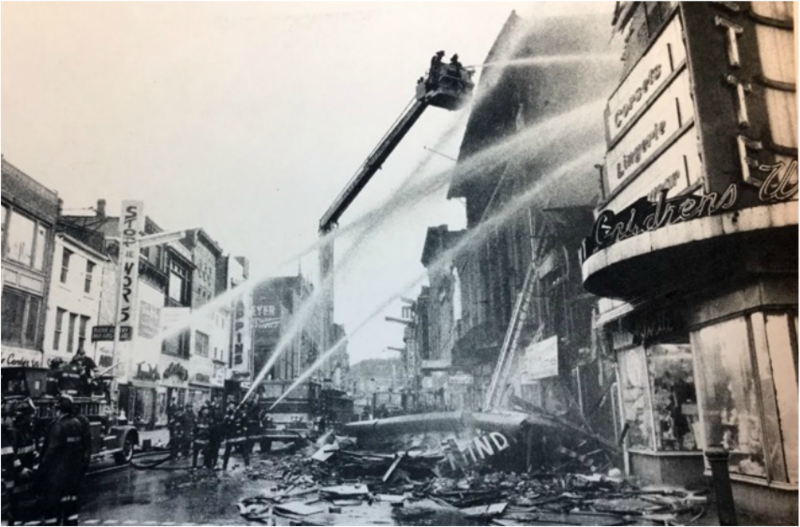 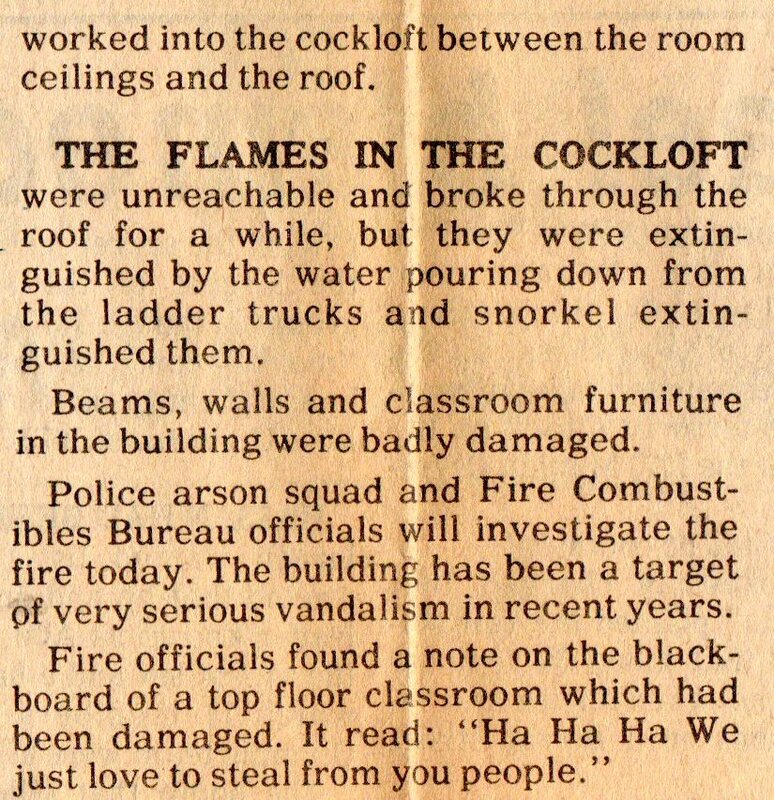 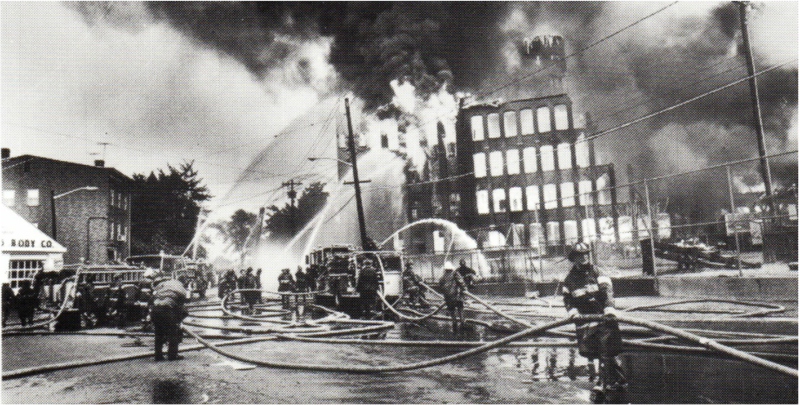 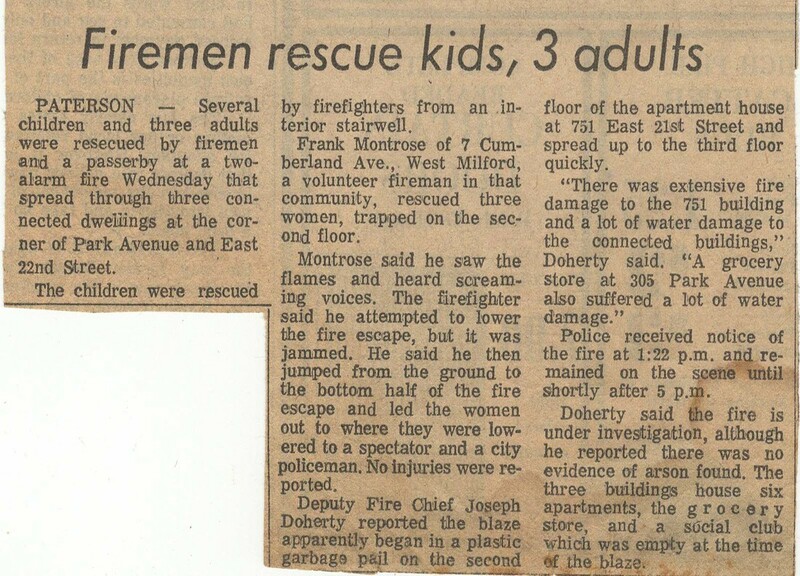 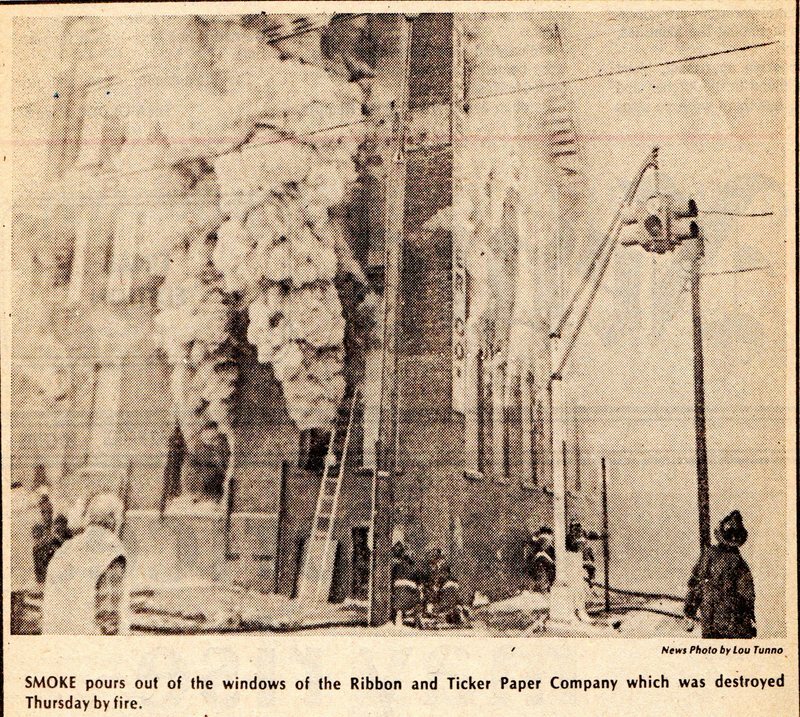 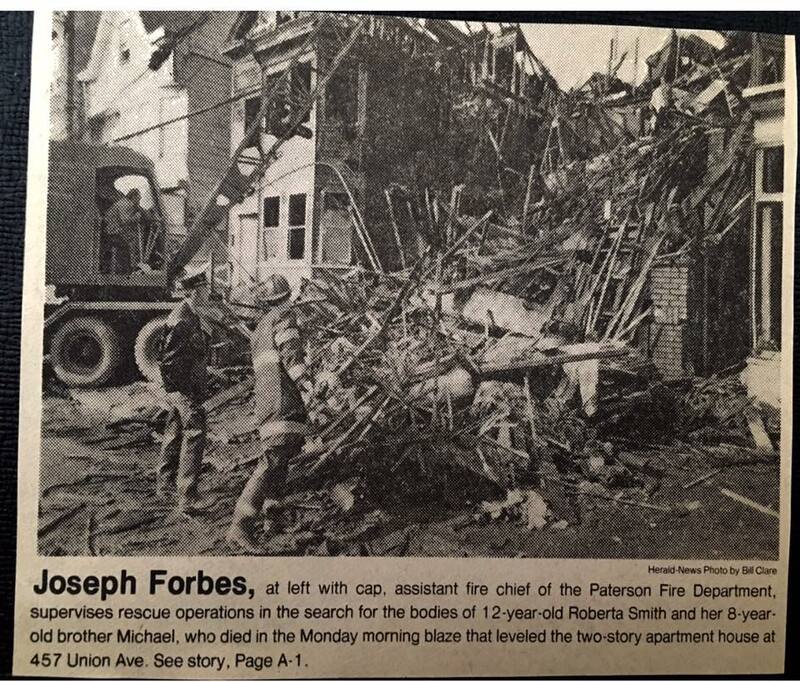 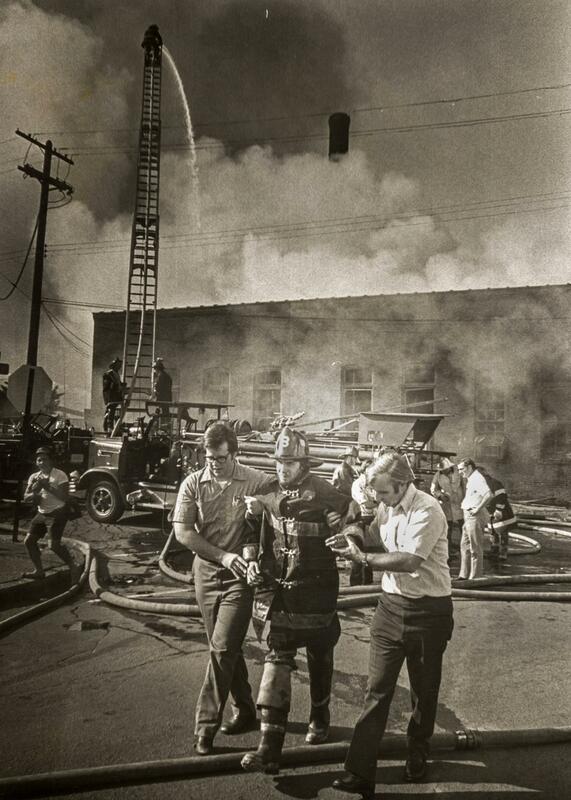 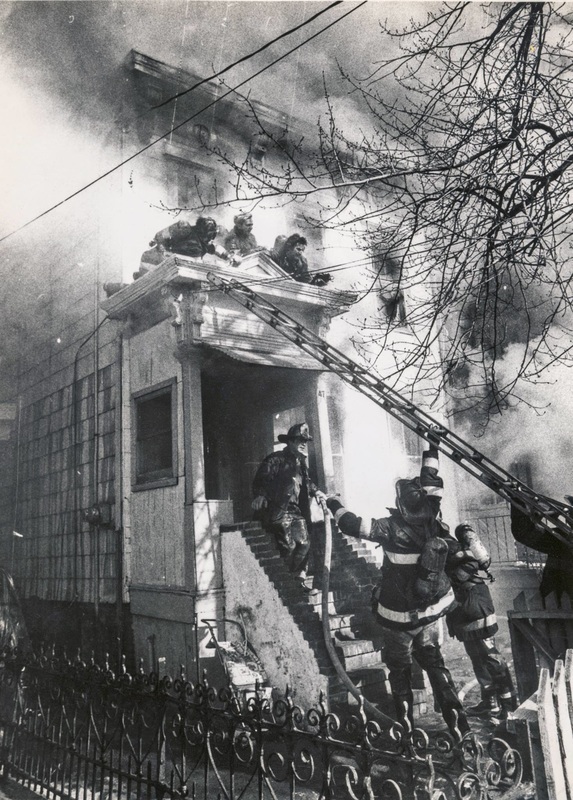 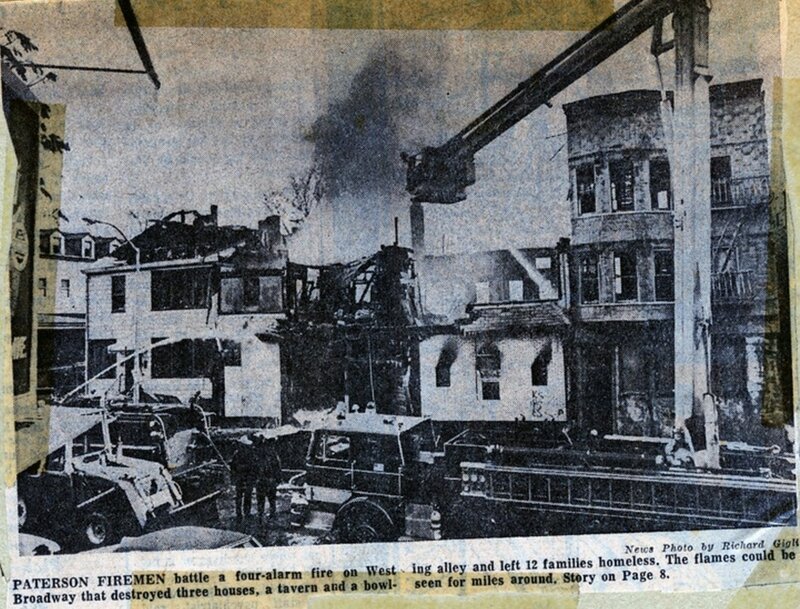 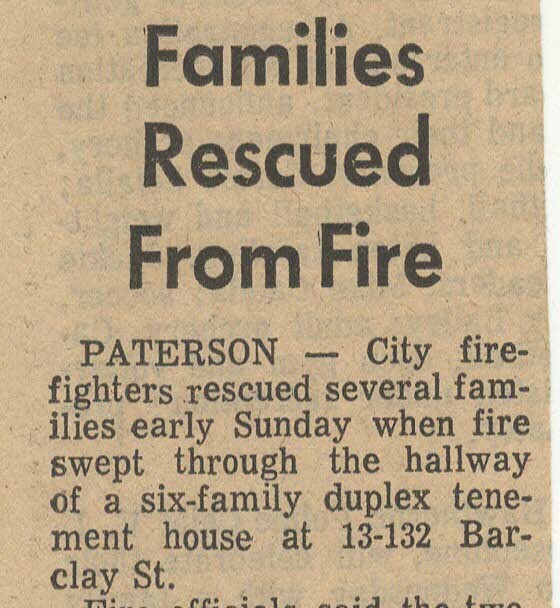 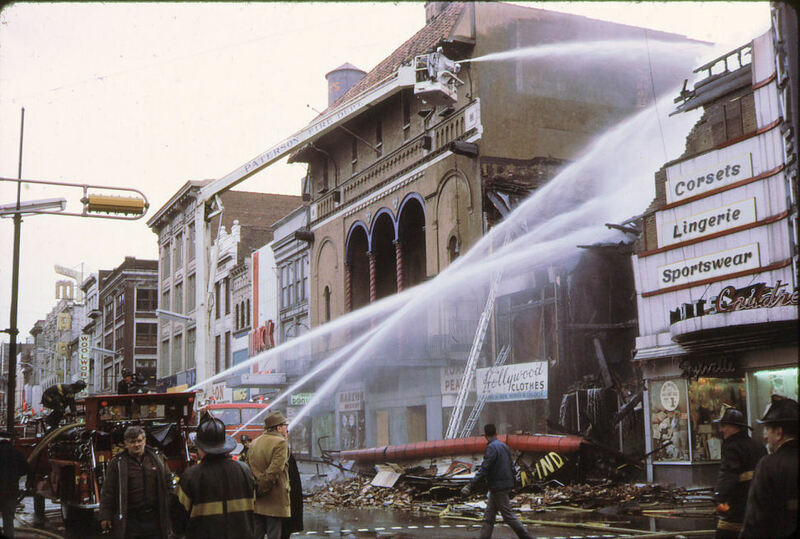 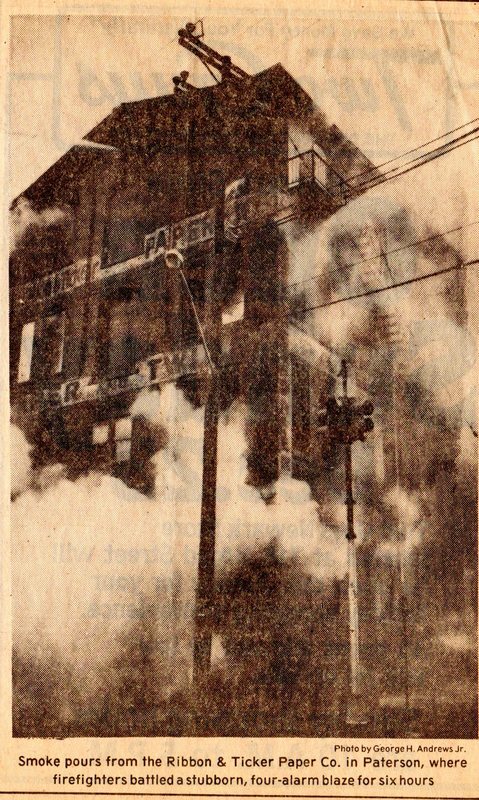 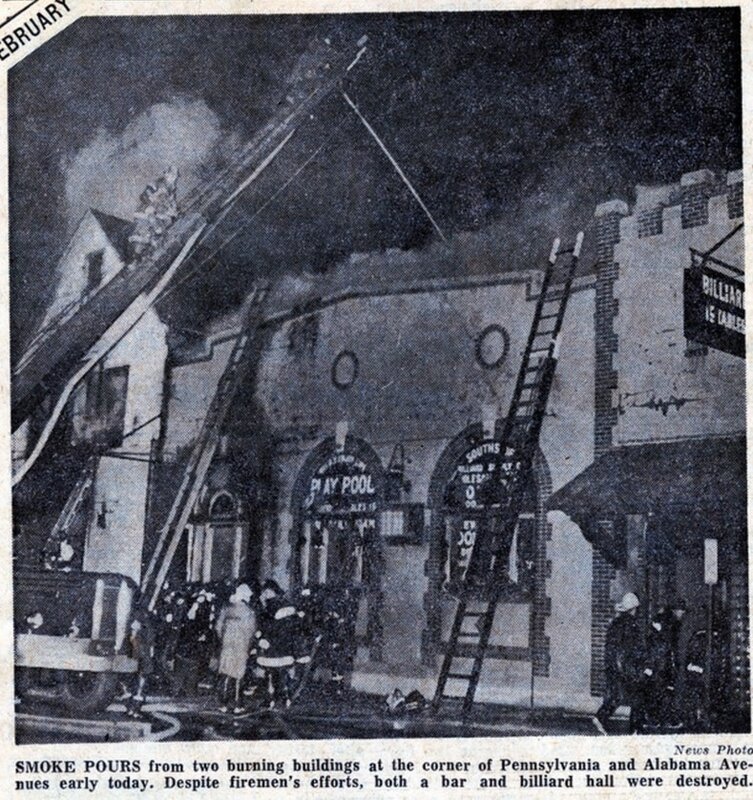 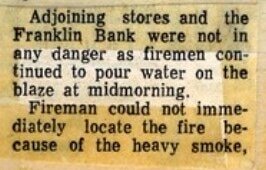 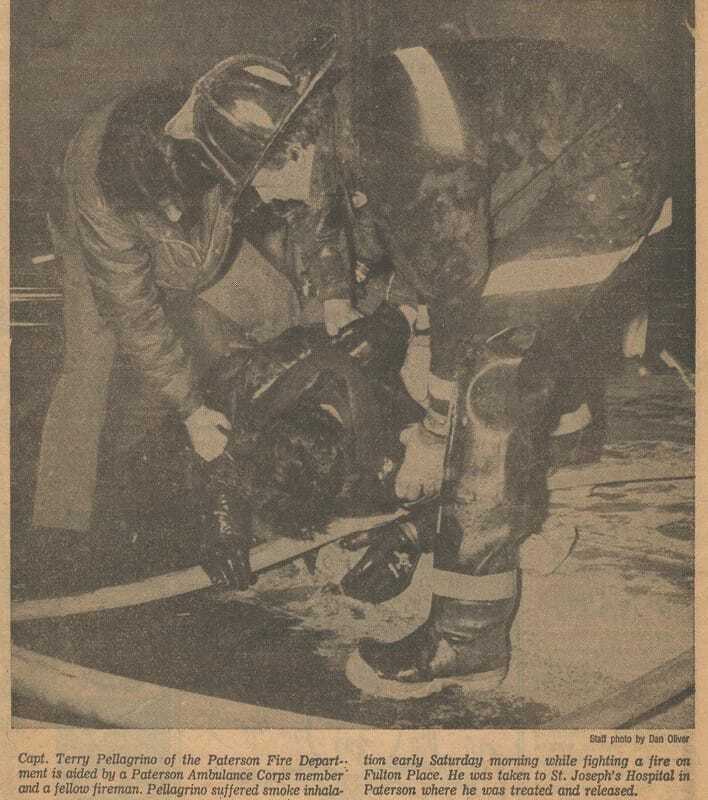 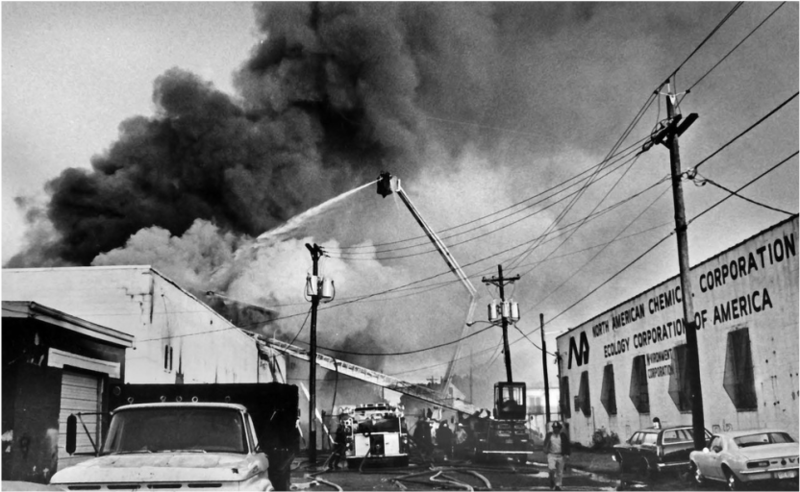 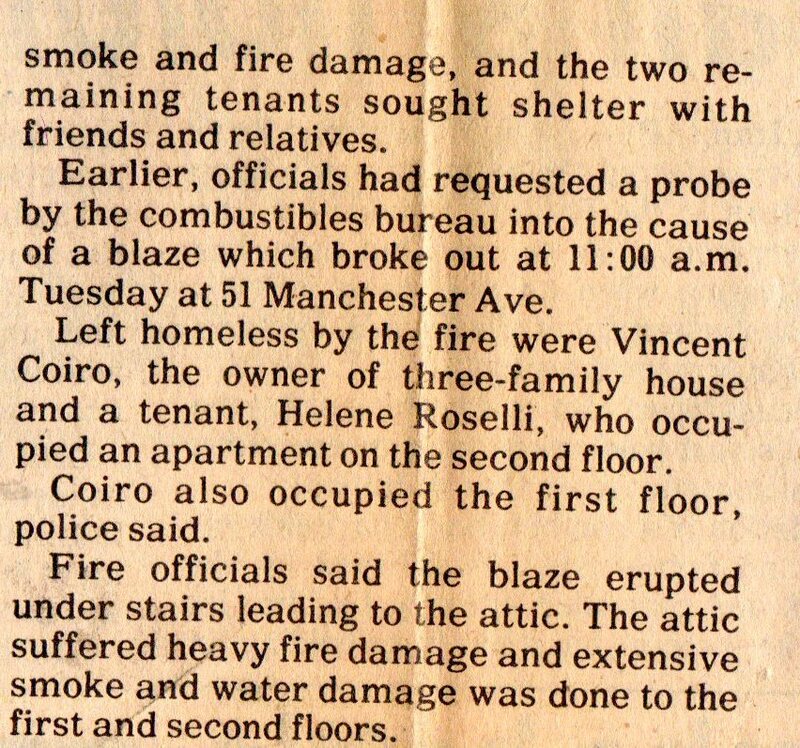 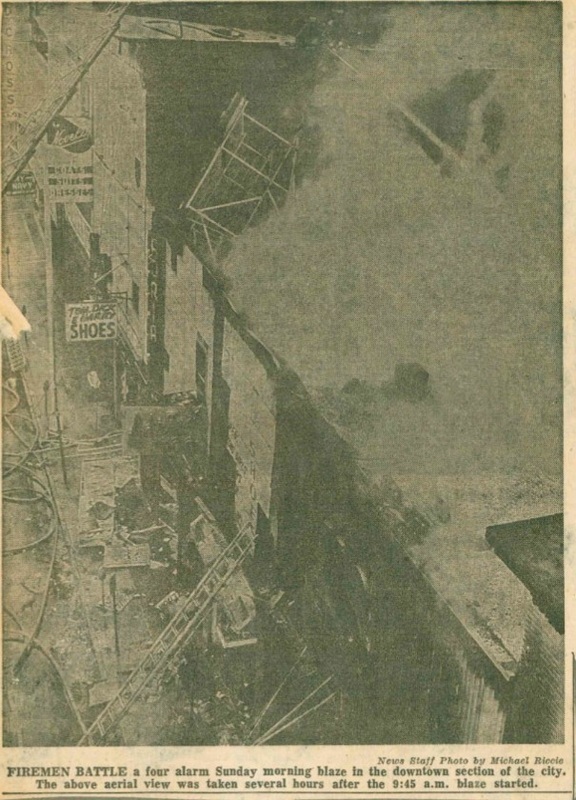 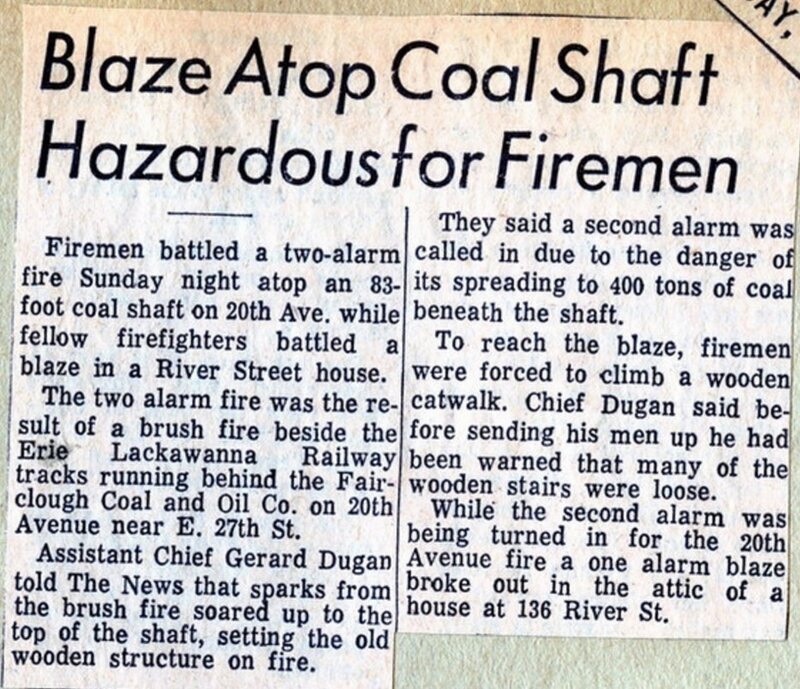 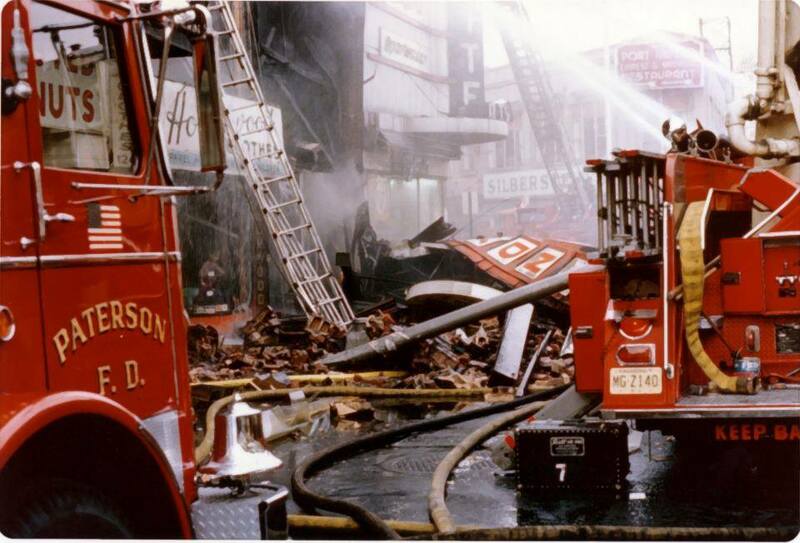 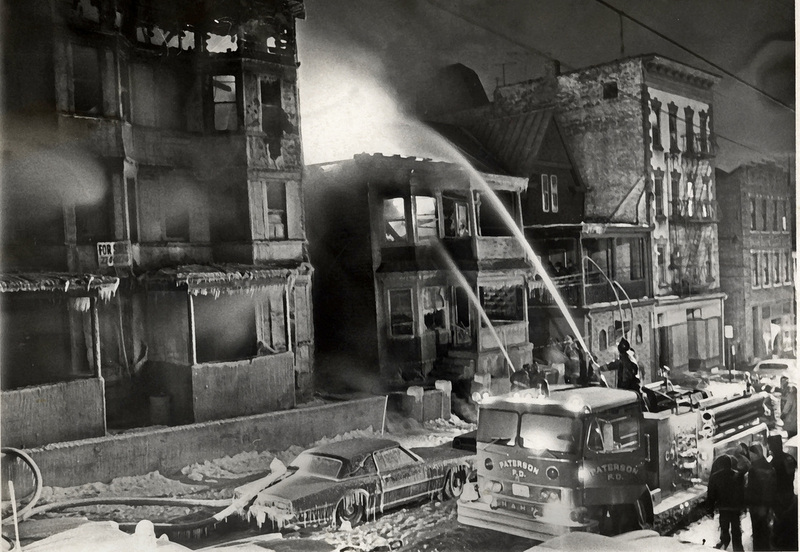 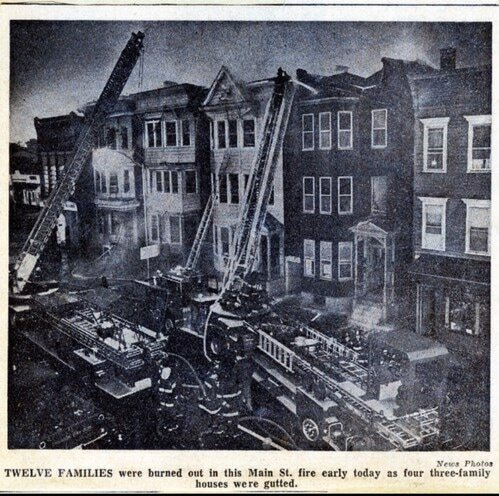 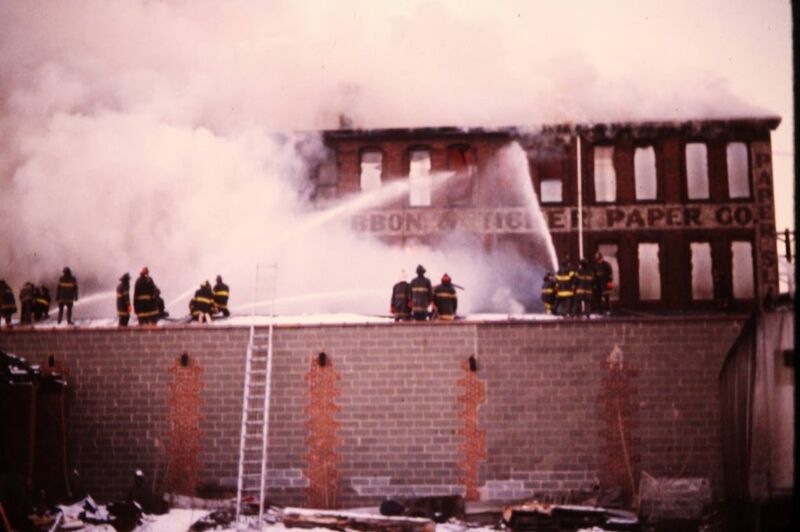 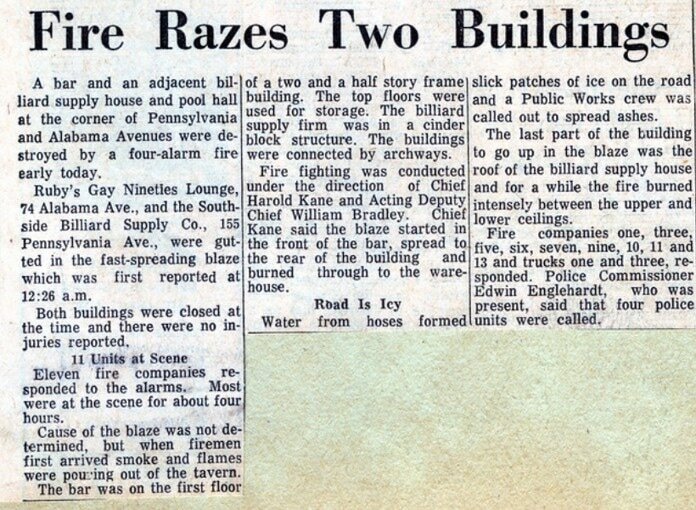 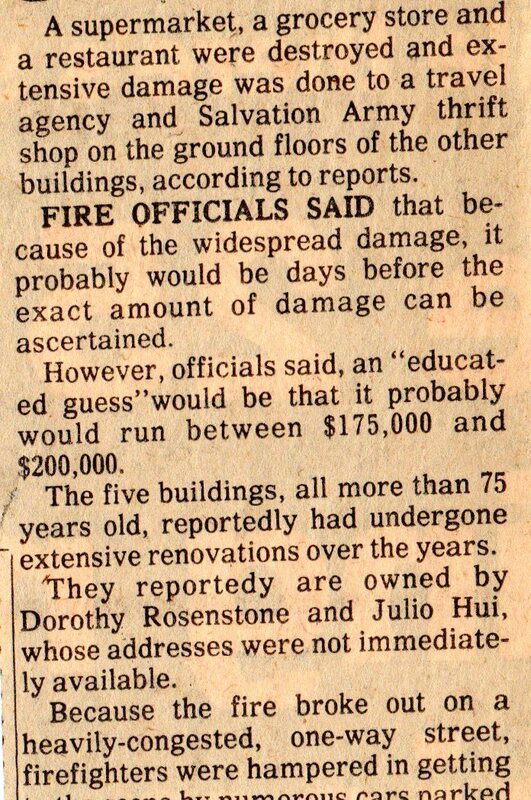 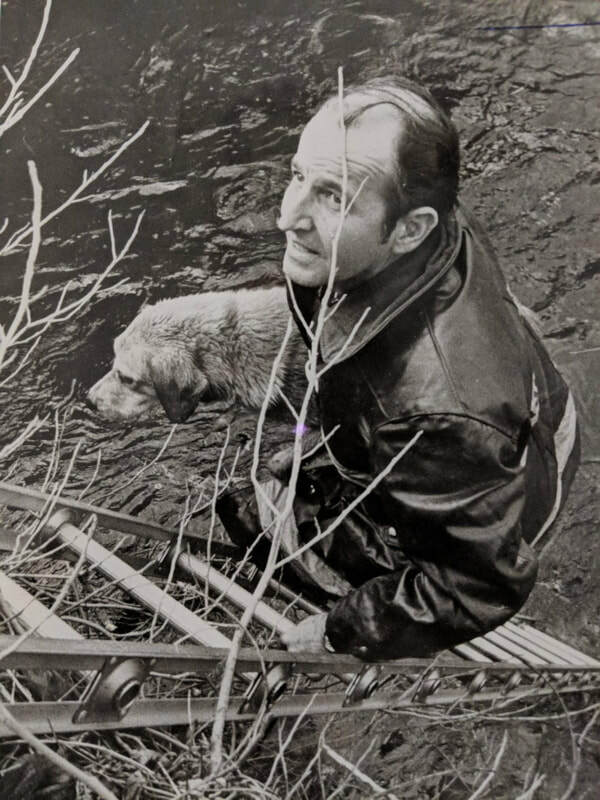 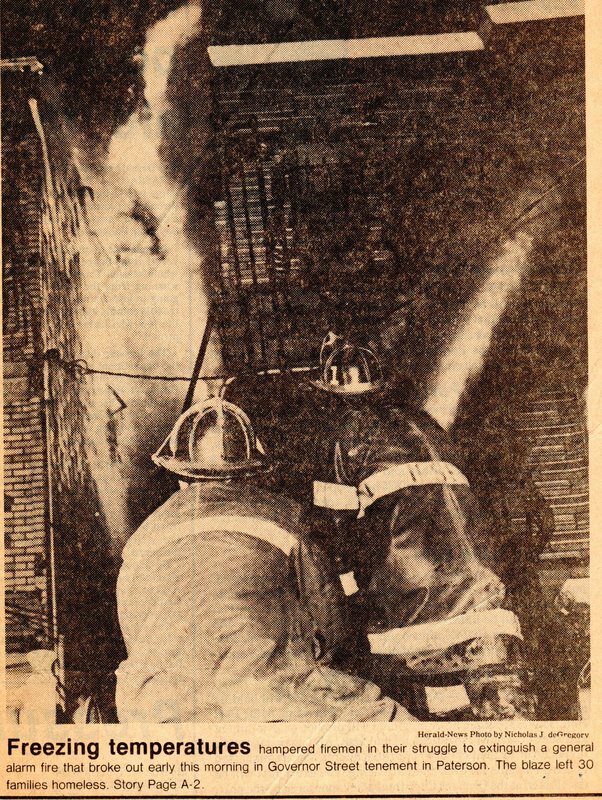 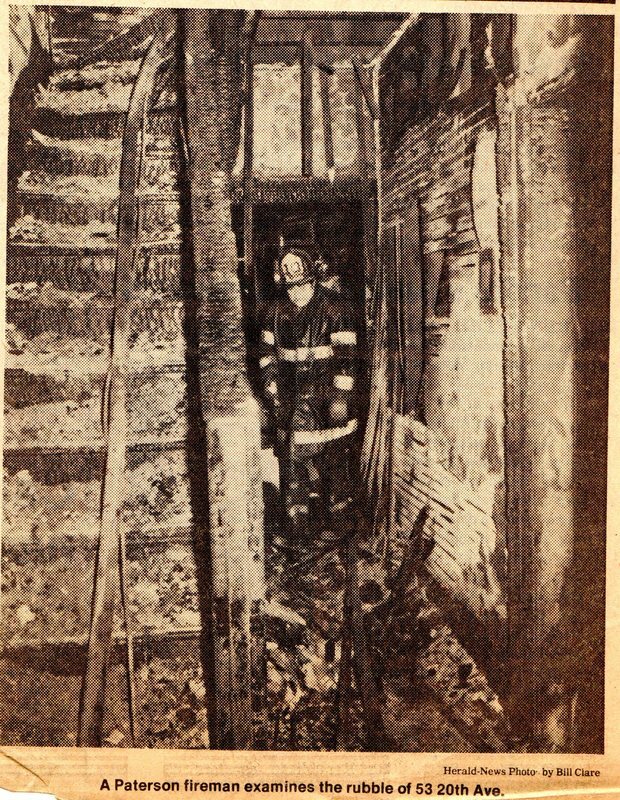 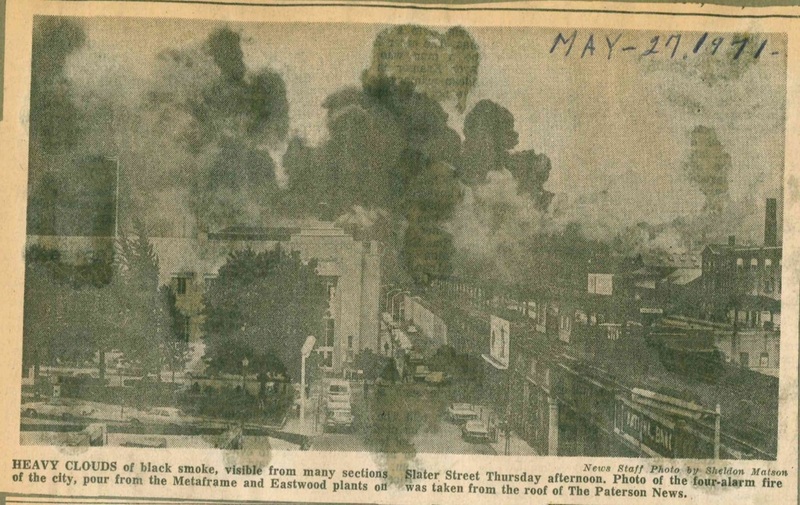 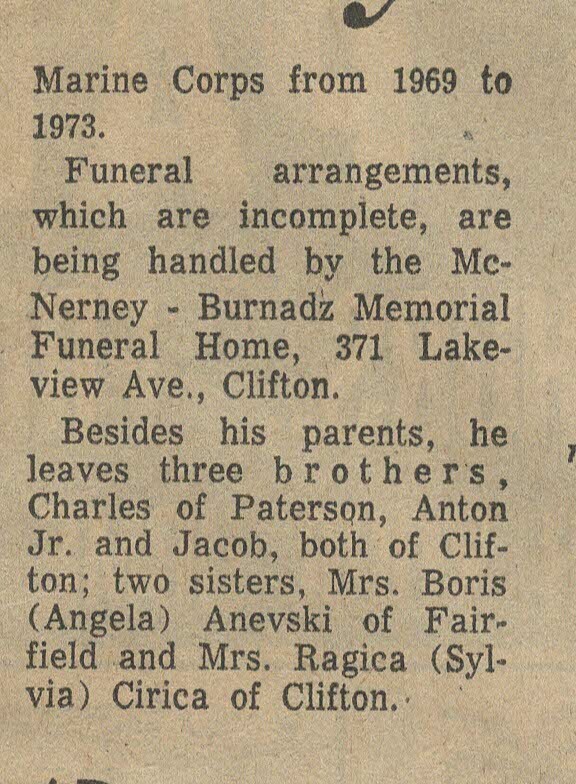 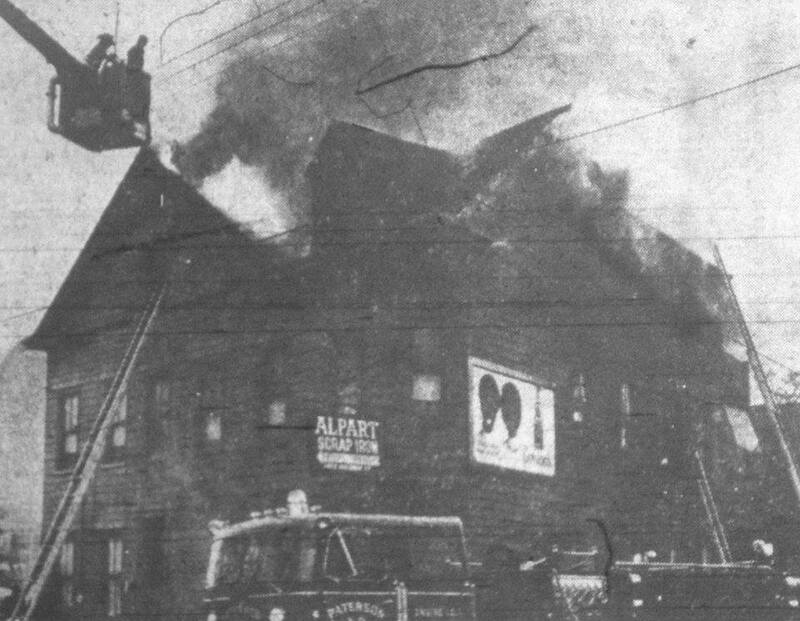 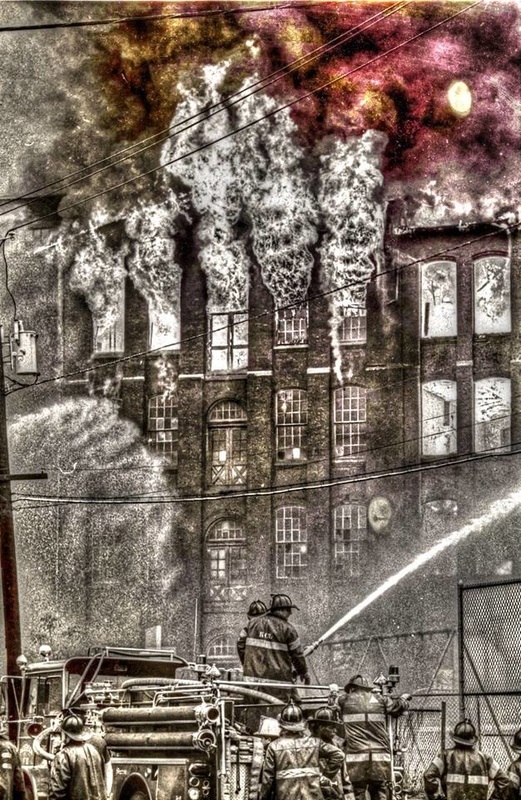 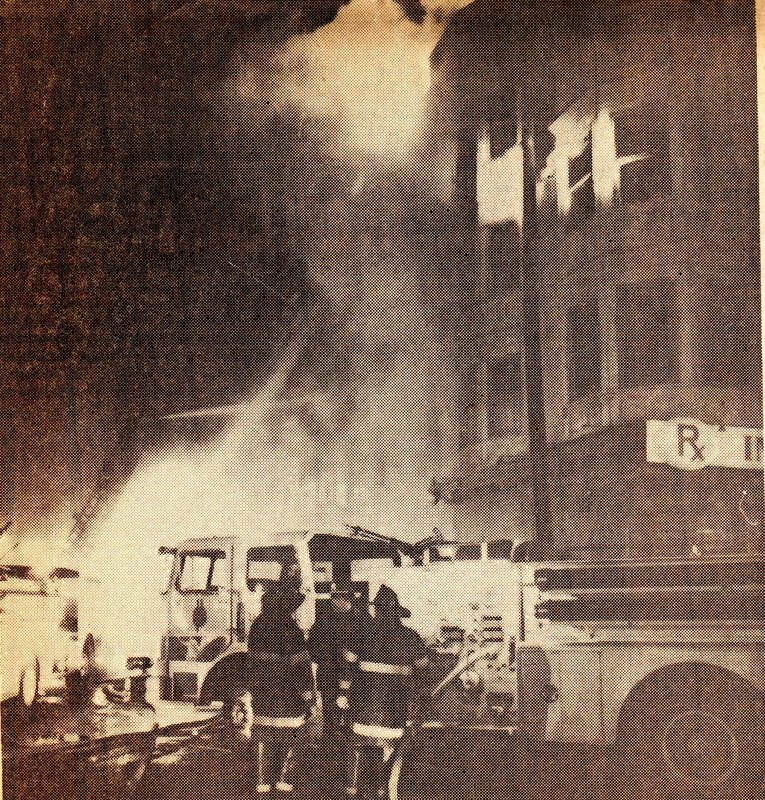 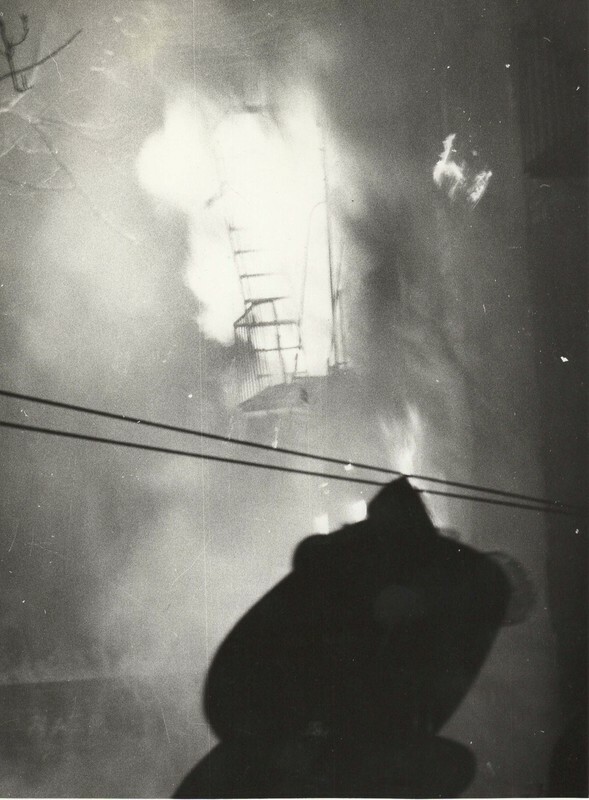 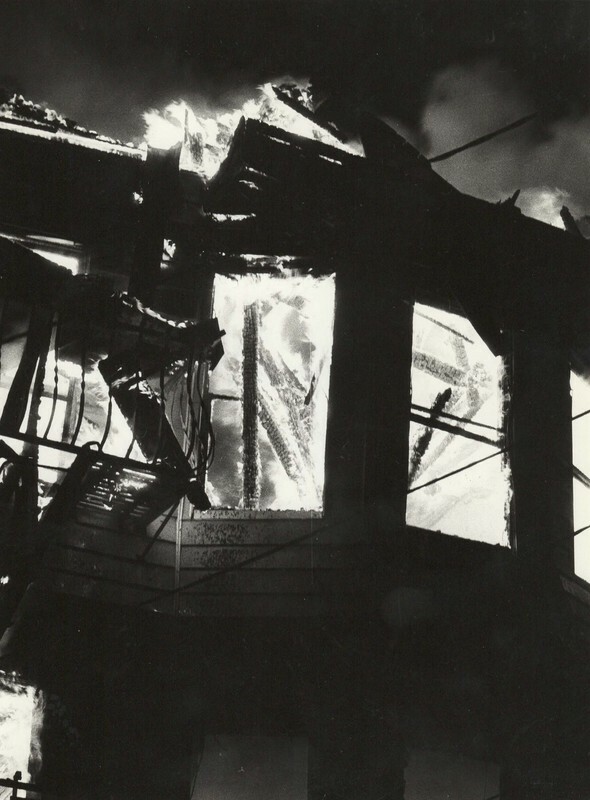 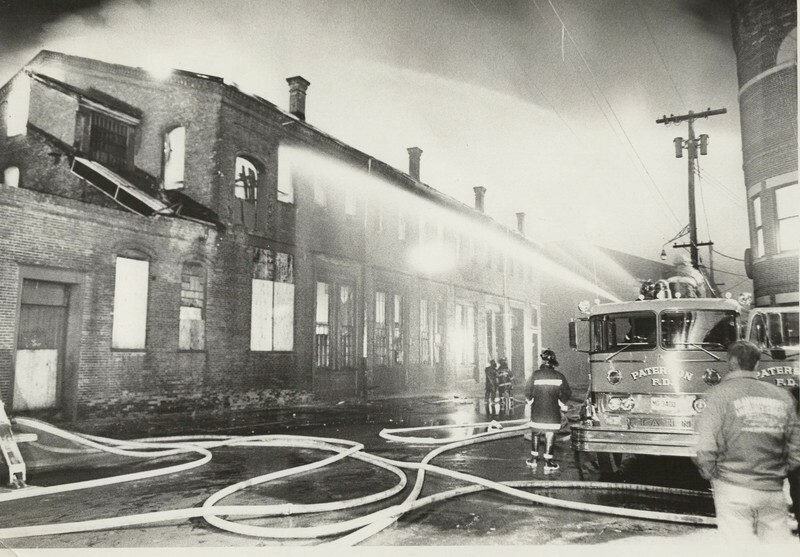 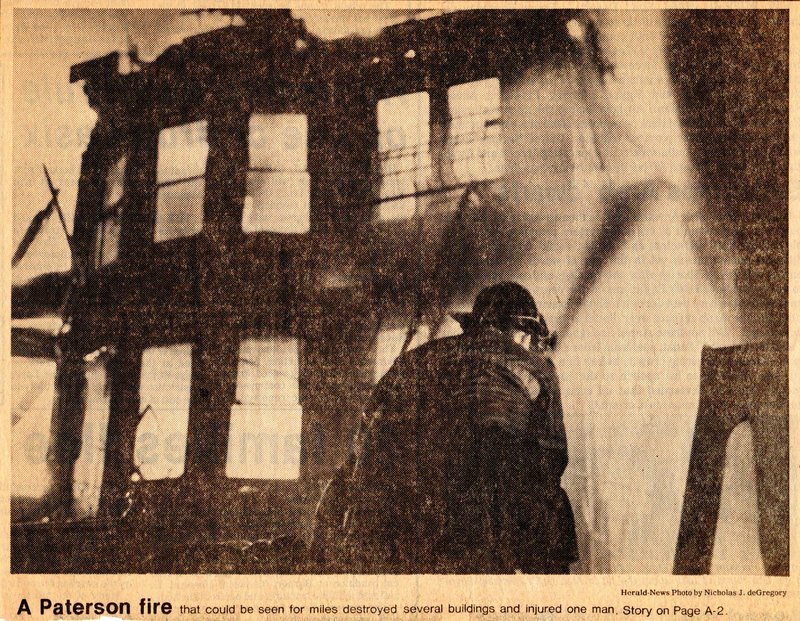 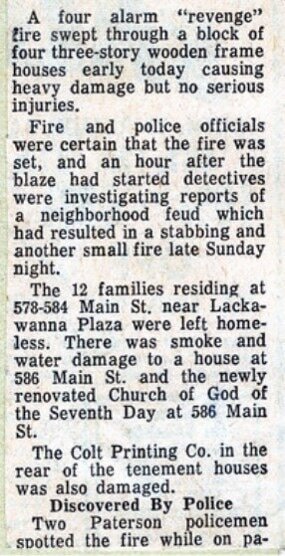 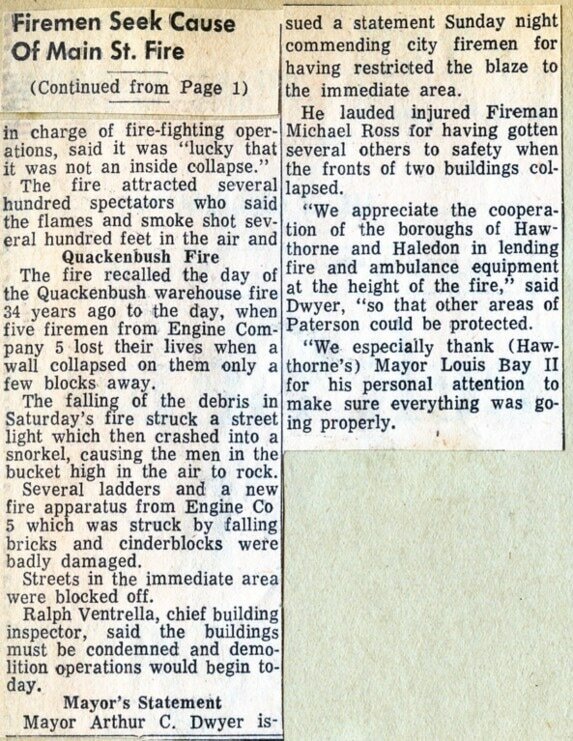 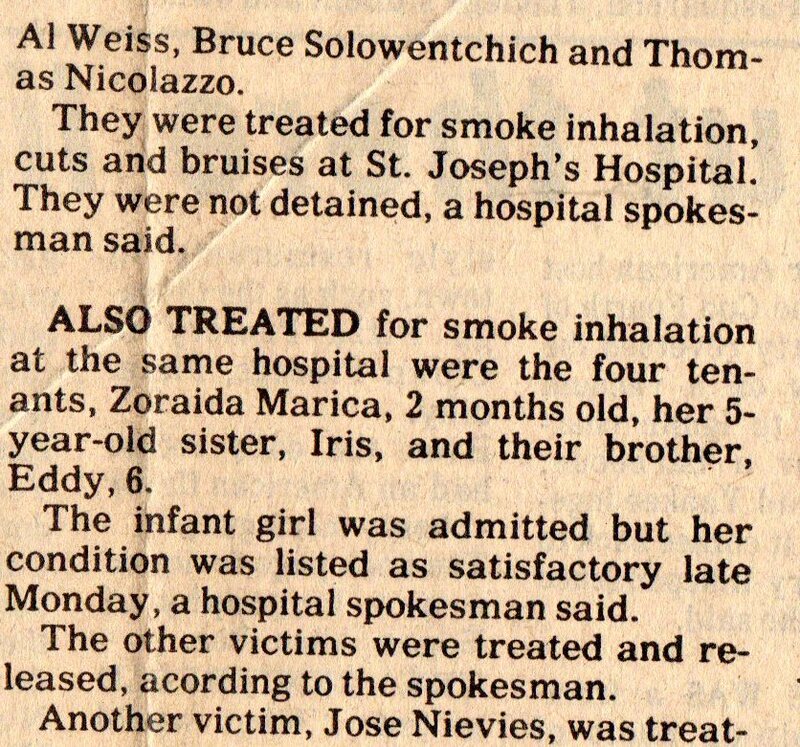 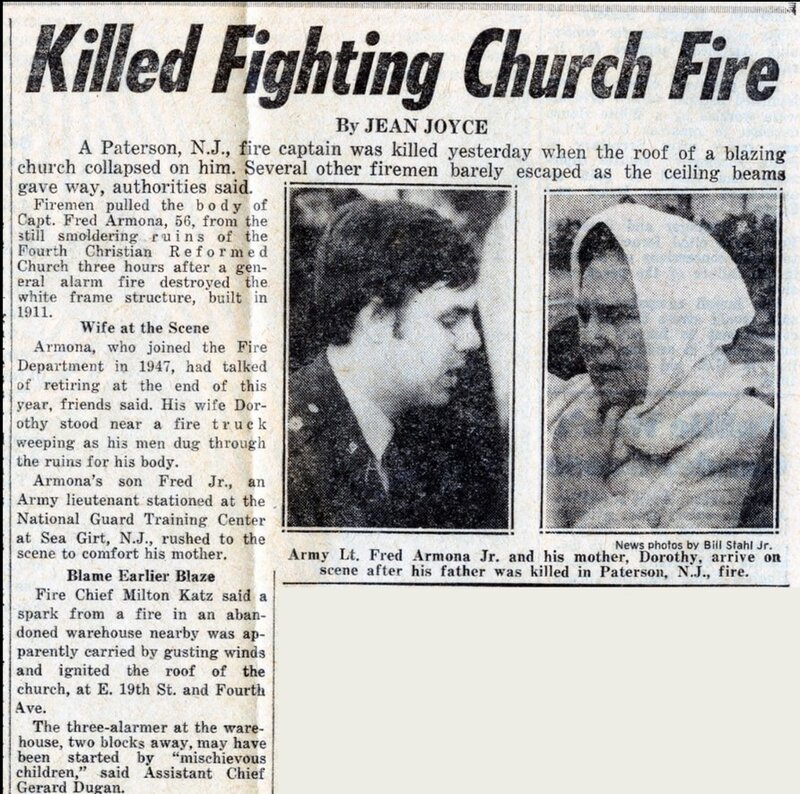 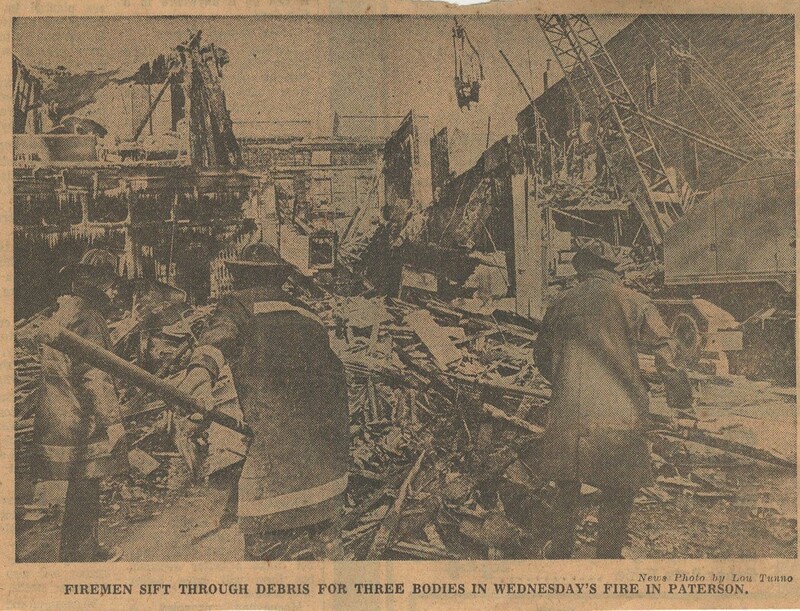 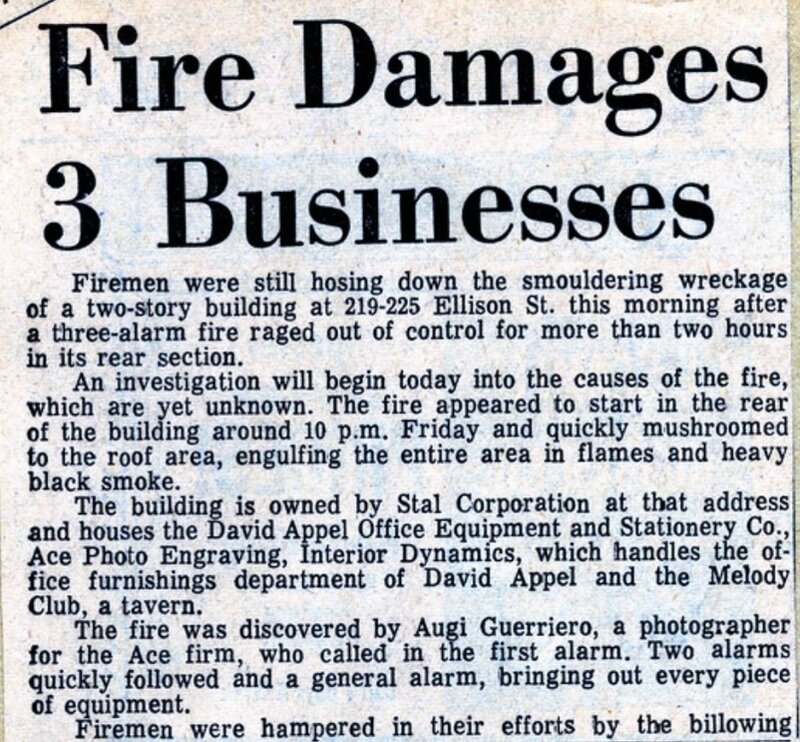 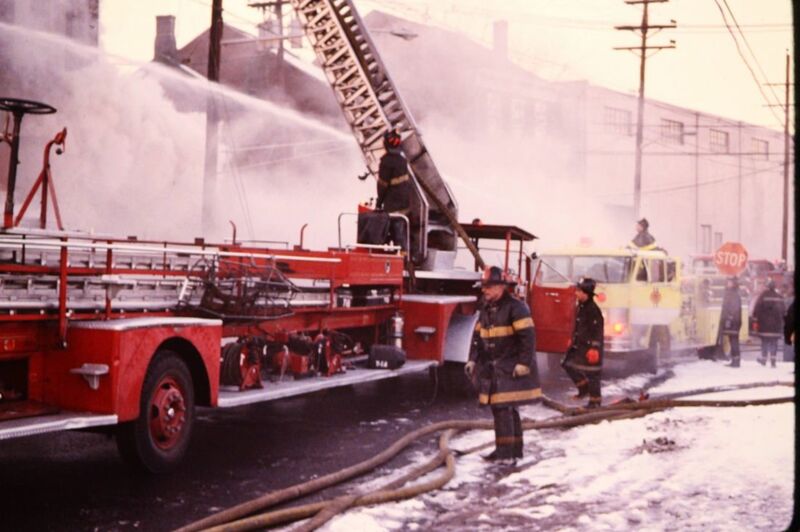 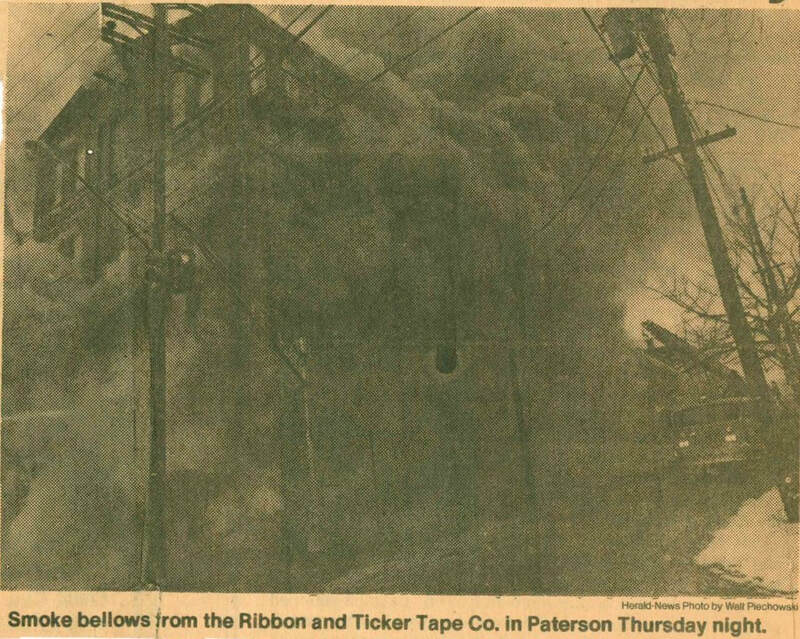 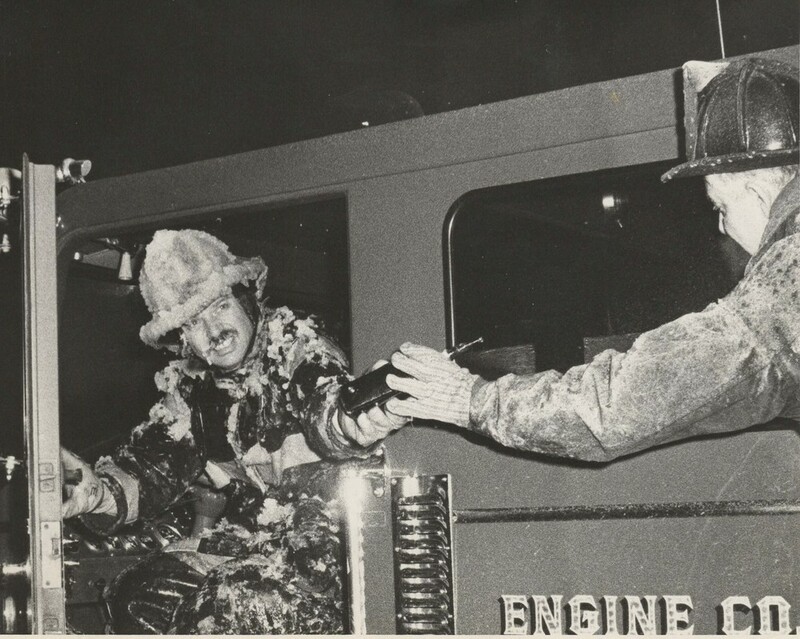 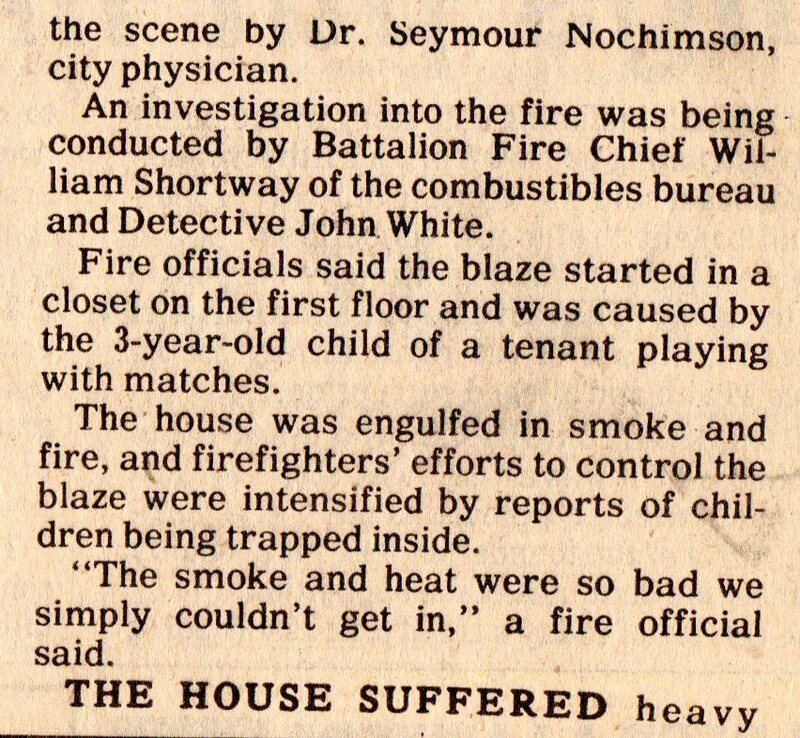 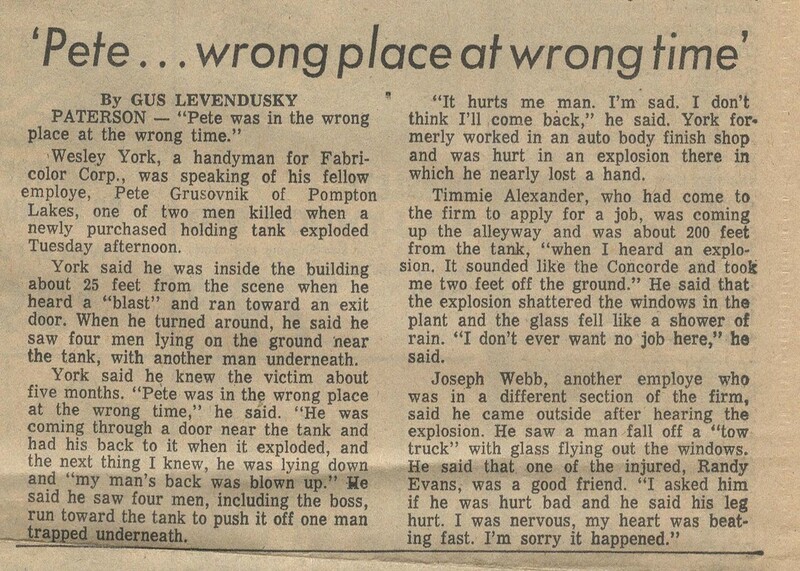 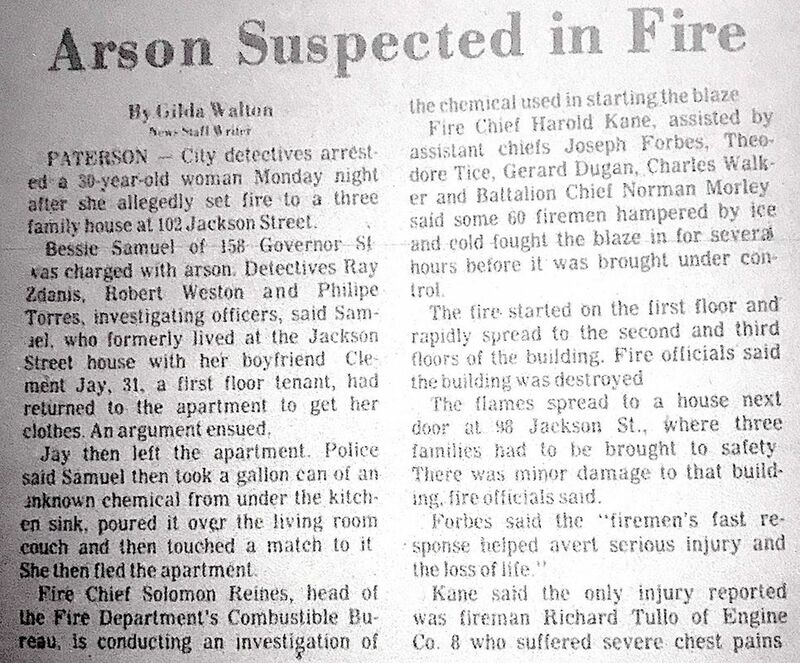 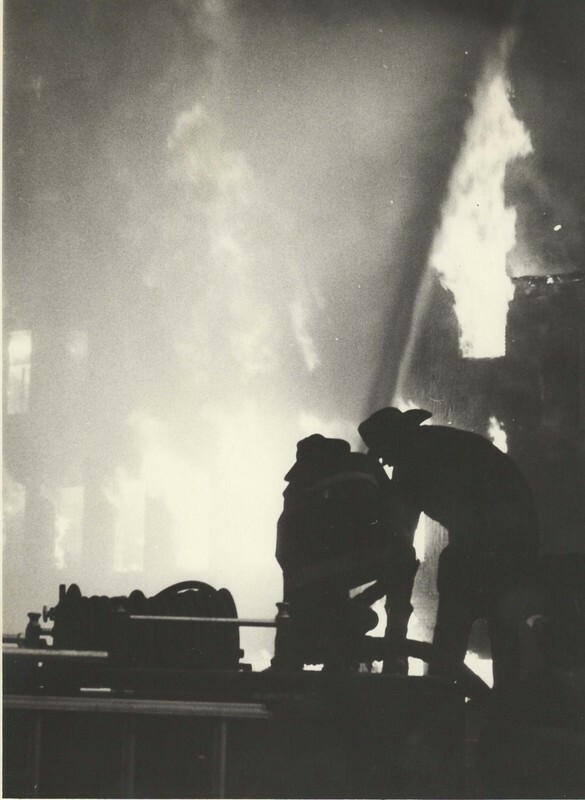 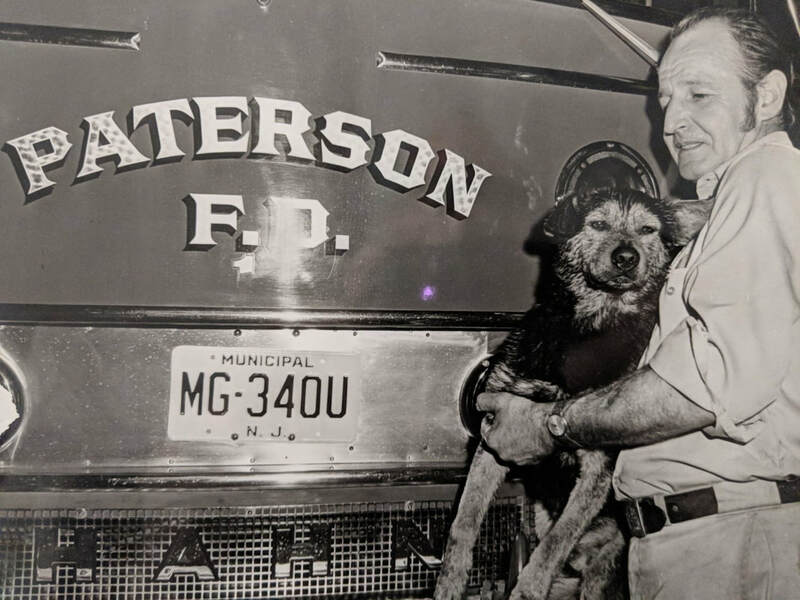 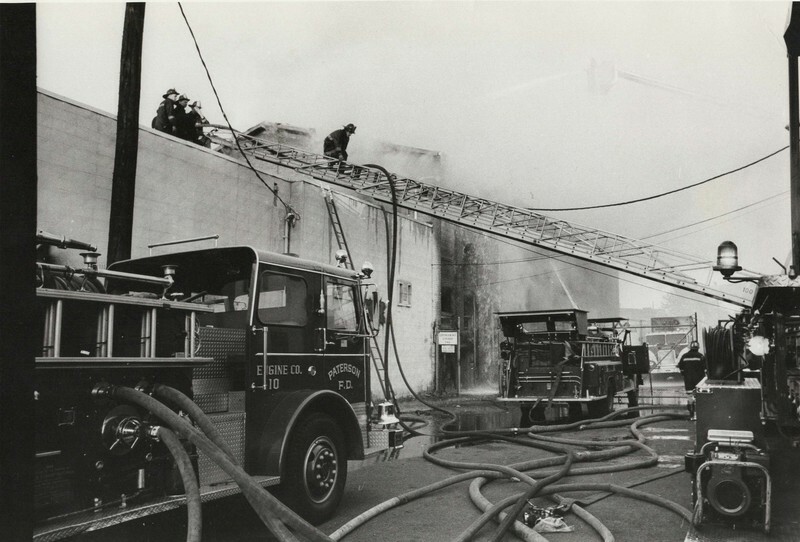 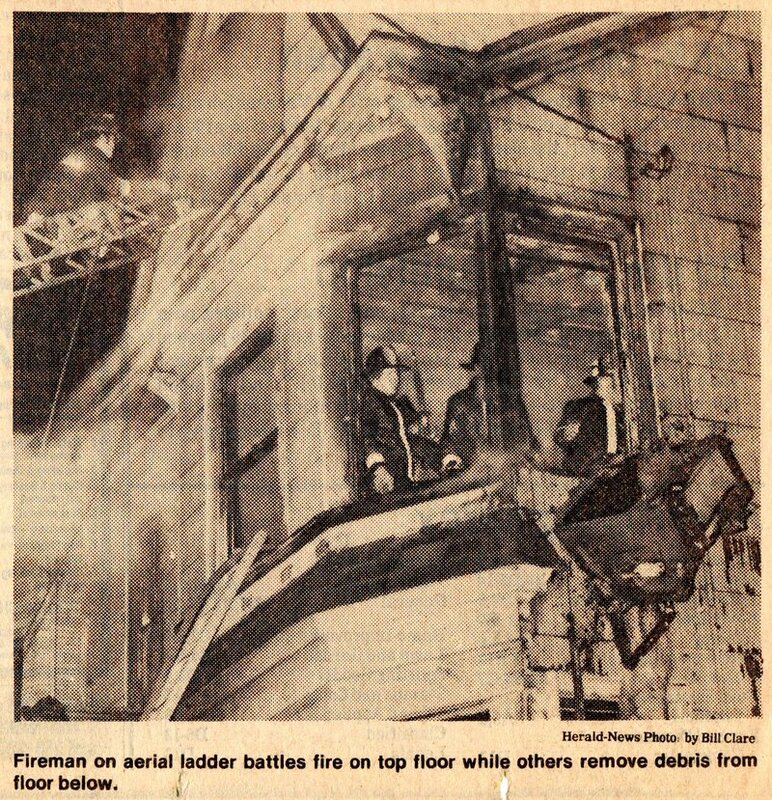 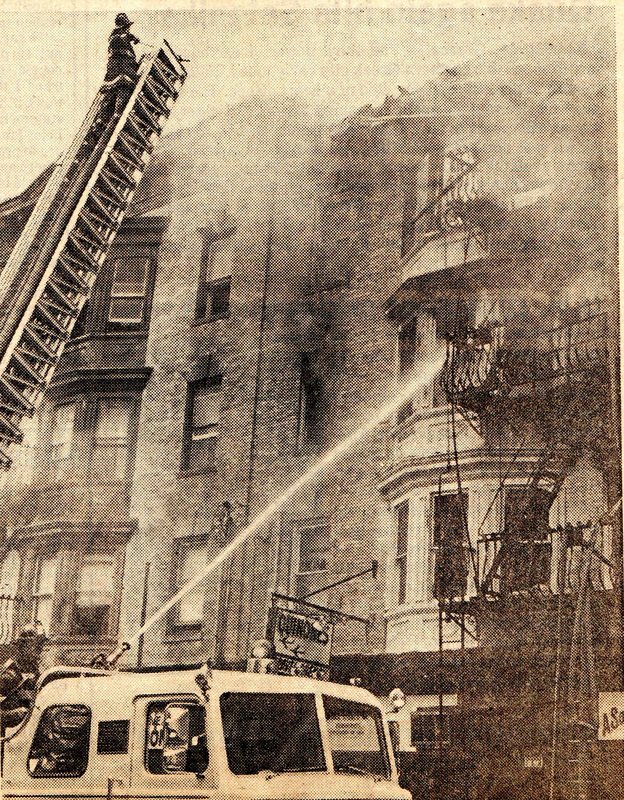 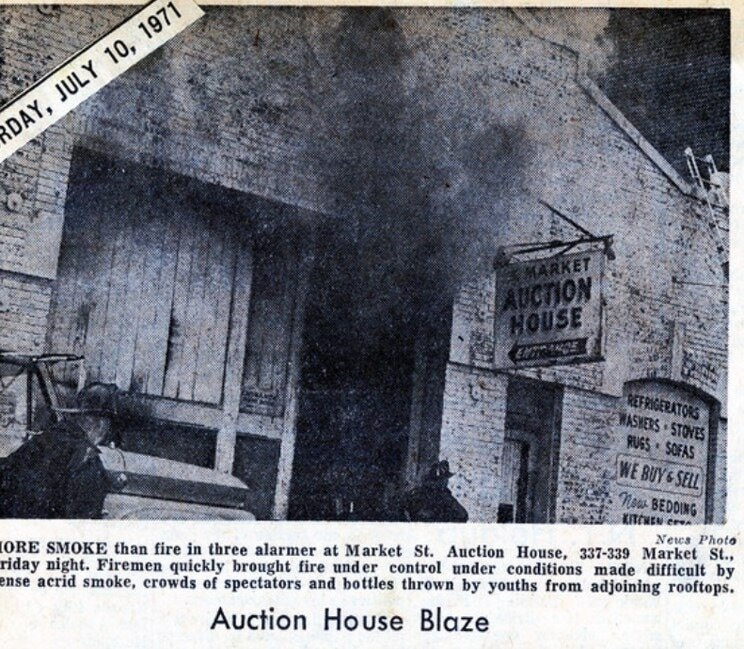 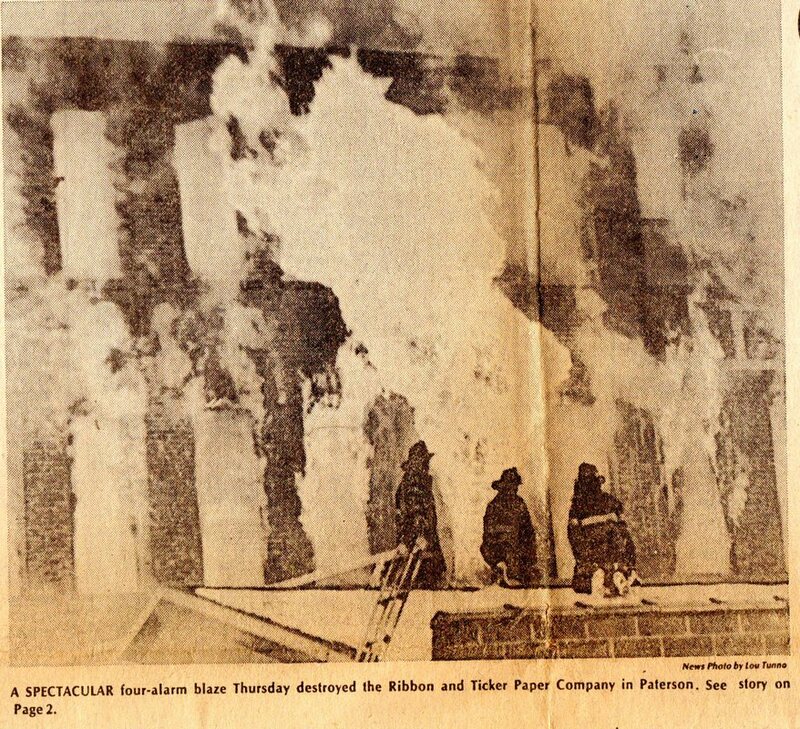 ​June 12, 1978: 259 7:45 PM 391 Hamilton Avenue 4th Paterson Tire Co.
Men on fire escape, Lou Tambone, T-1 & Rich Hoffman Sr., T-2. 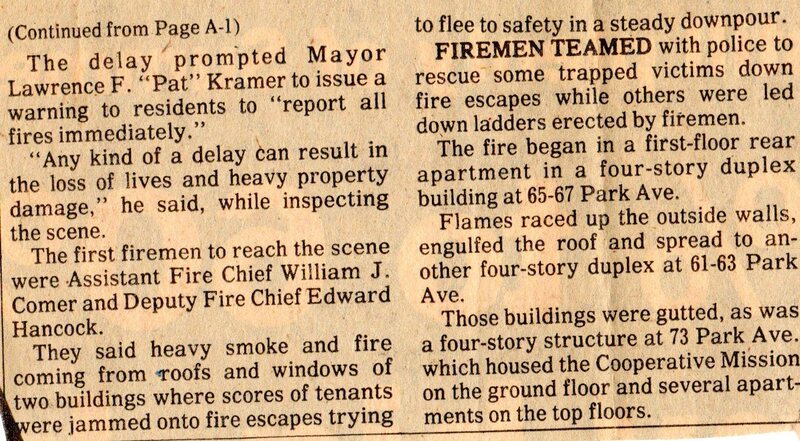 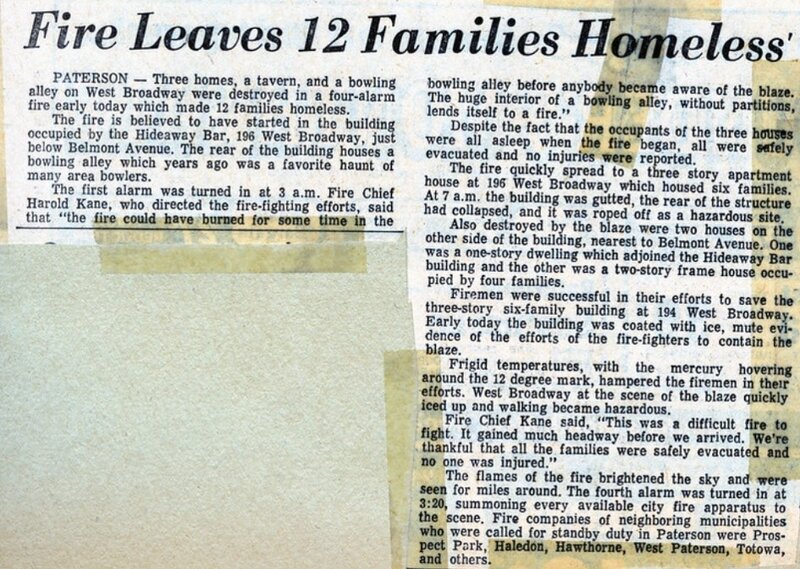 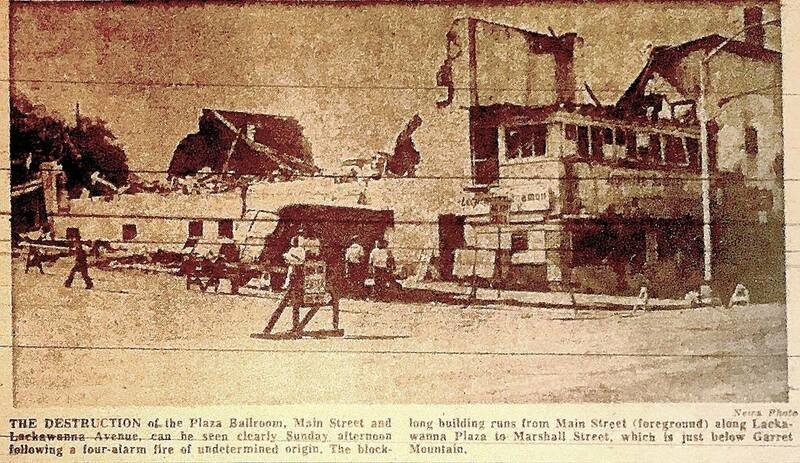 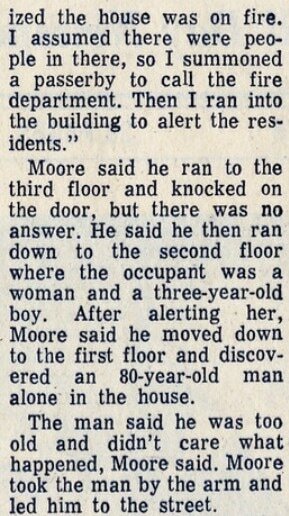 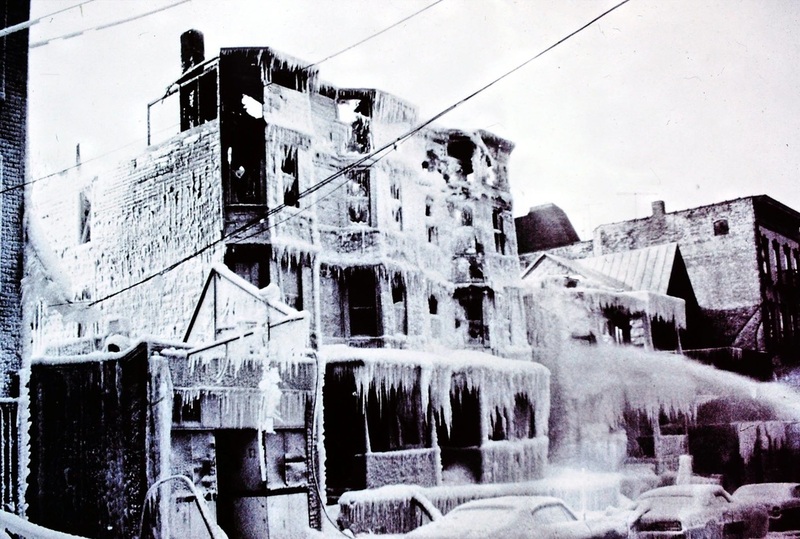 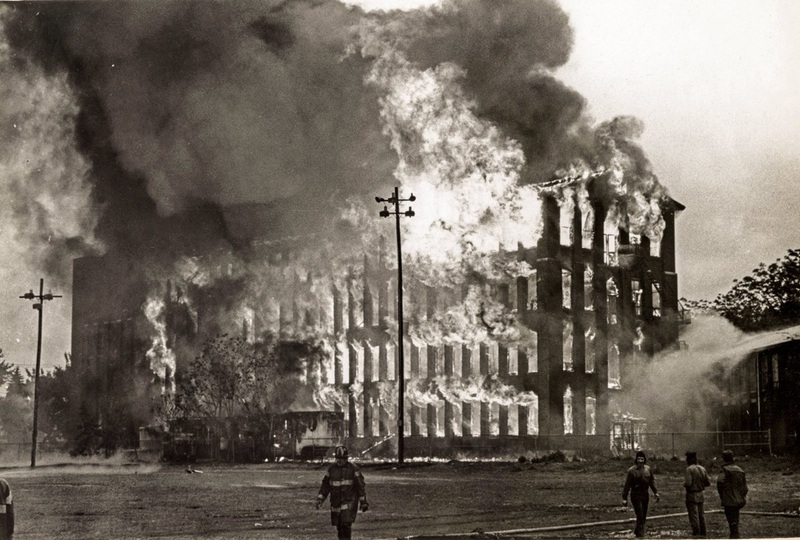 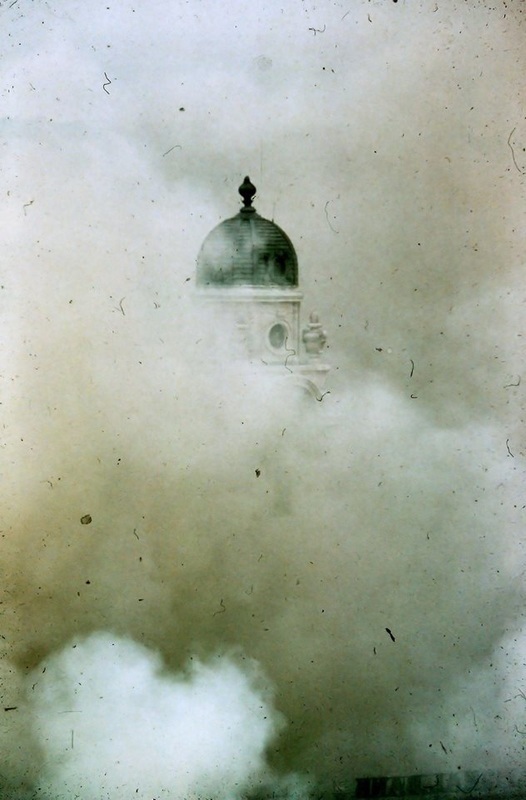 Upper portion of the fire escape protected the men when the cornice let go. 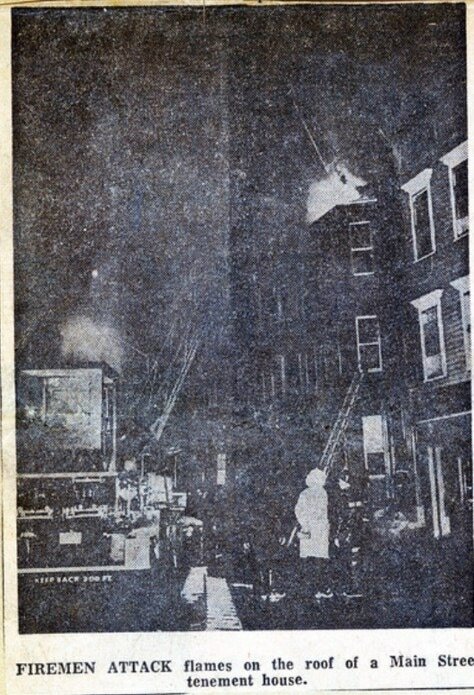 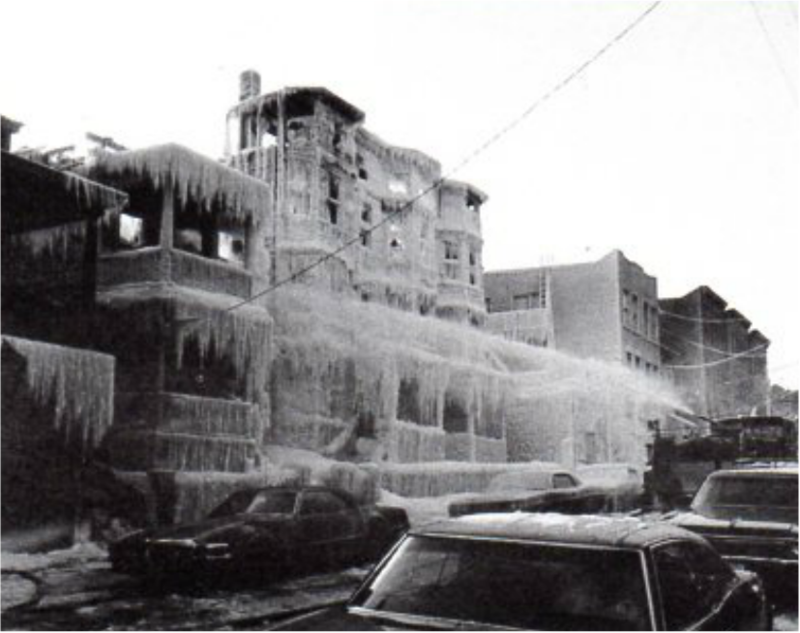 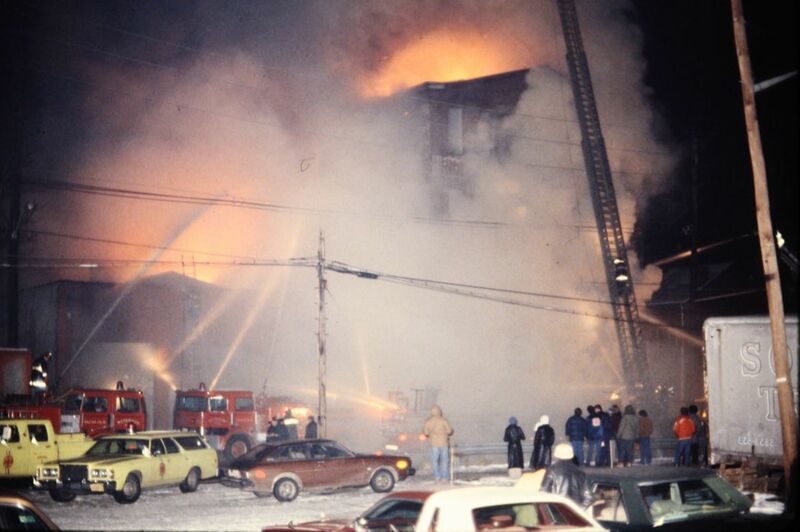 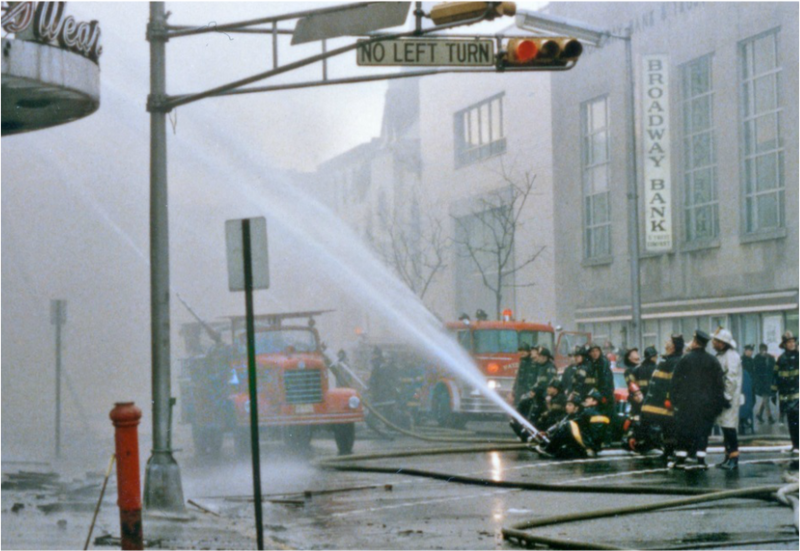 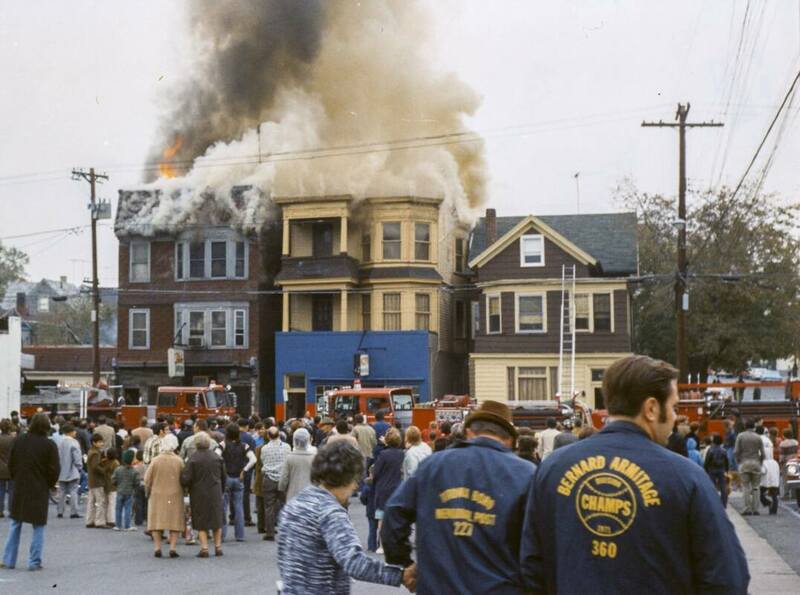 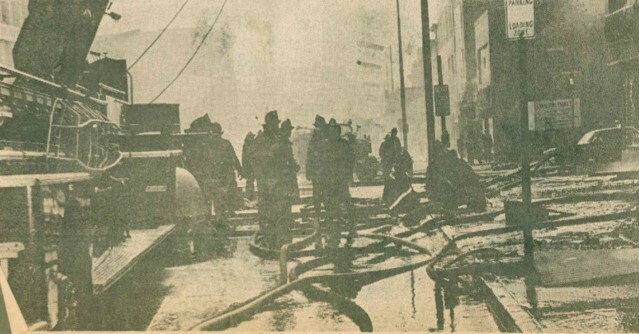 November 25, 1979: 123 4:17 AM 99 Cliff Street 4th Cliffside Dye Co.
Pic taken looking down Railroad Avenue towards 20th Avenue. 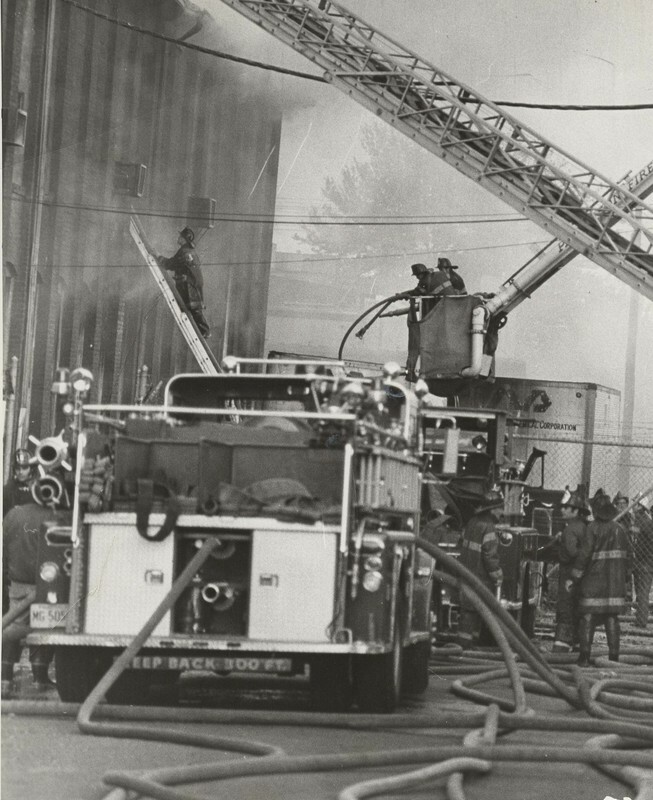 E-13 in middle of pic. 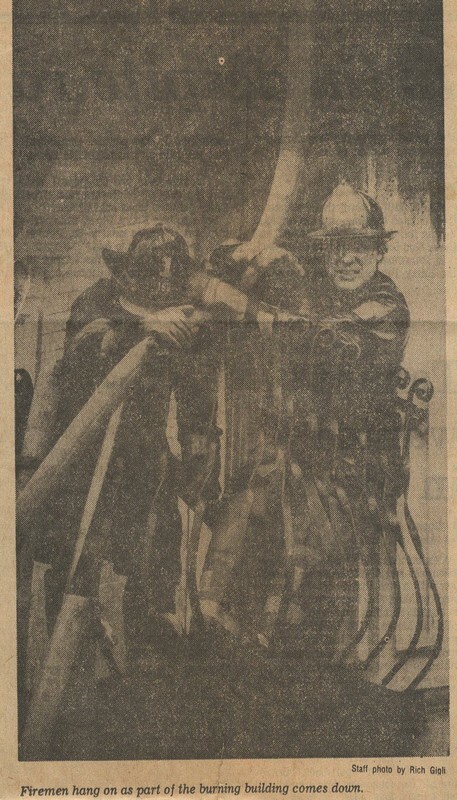 John Malone is in middle of pic & Joe Mendillo is to the right, E-13 members. 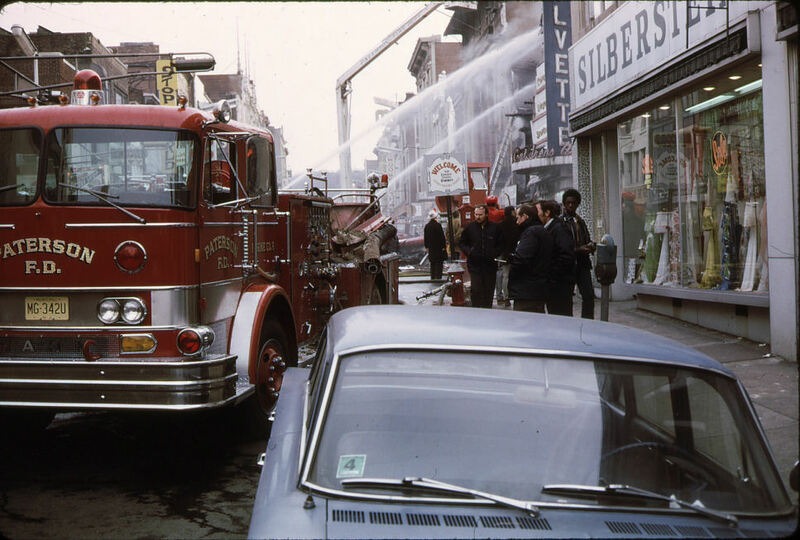 Squad 1's '76 Ford crewcab at the right. 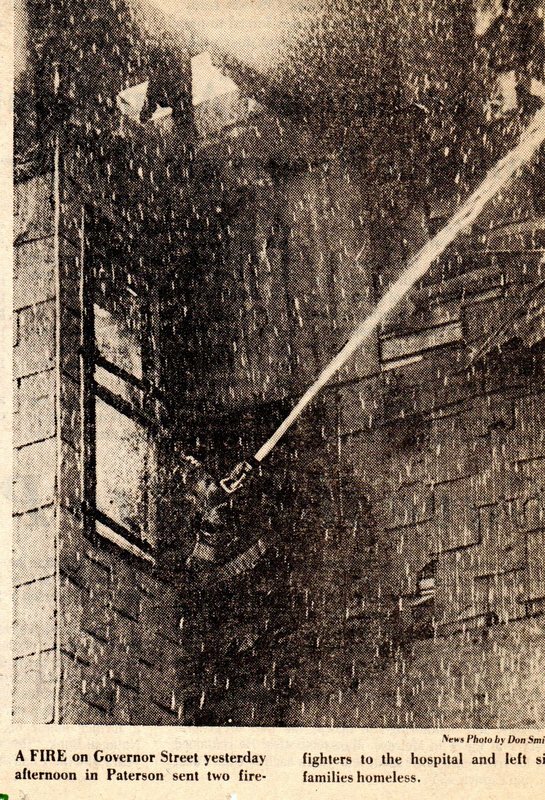 Close-up of T-1. 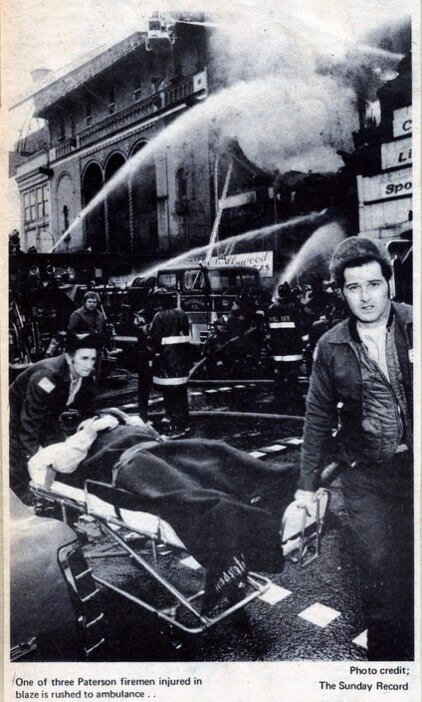 Al Credidio on turntable, Vic LaRegina in foreground. 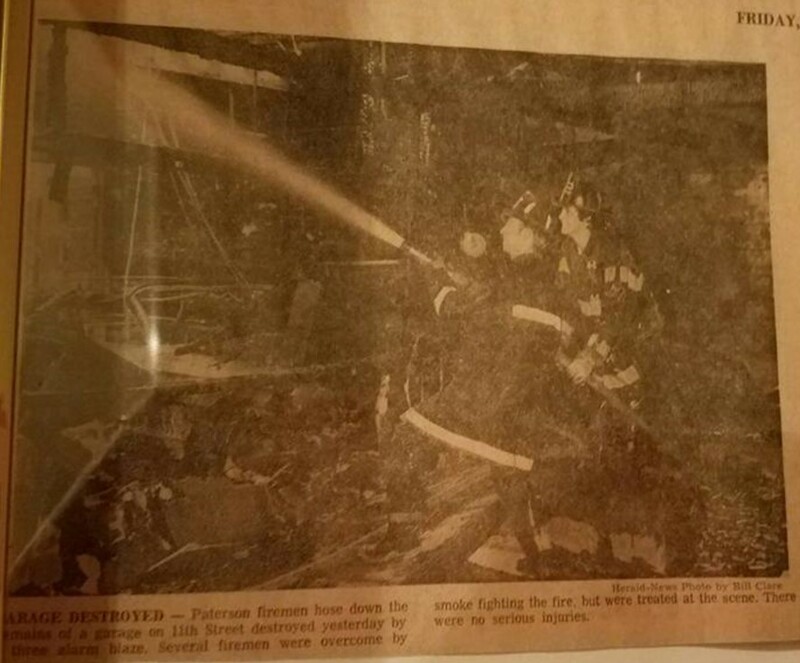 FF on the right may be Manny Torres, E-6. 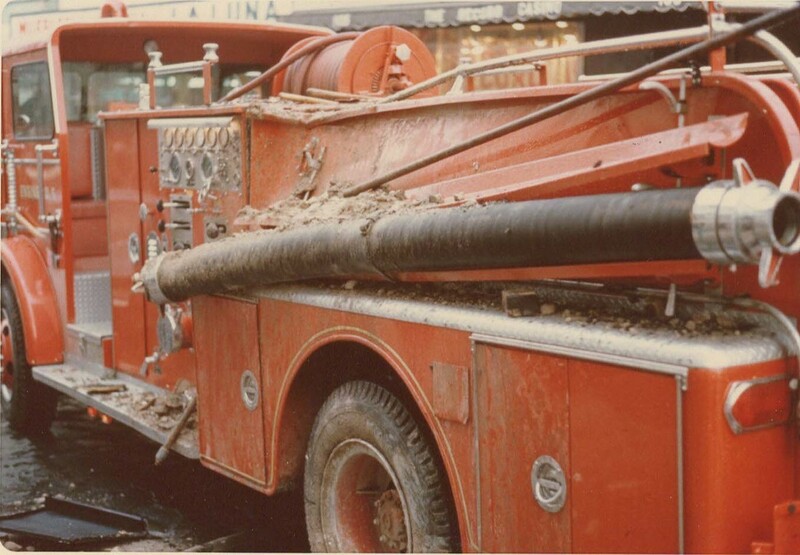 Notice the tiller cage is missing.